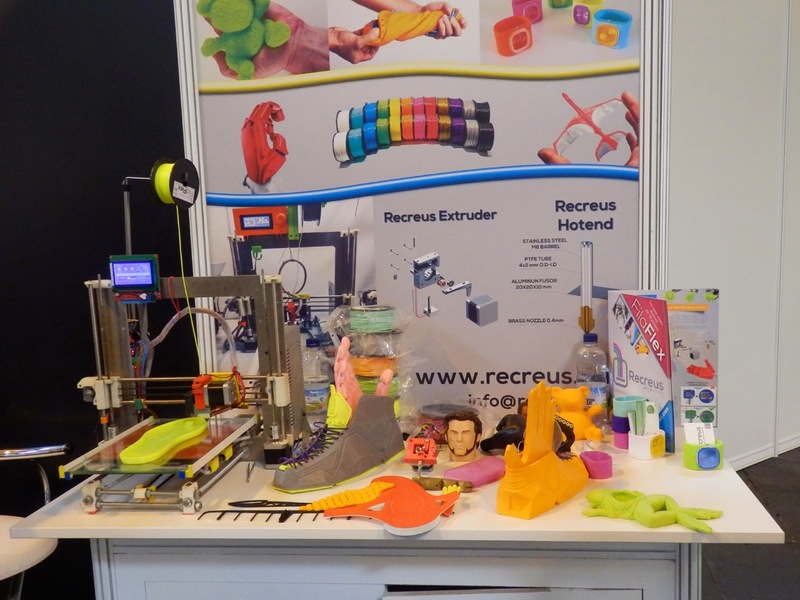 The 2014 TCT Show was another total success for the RepRap, Open Source and Maker community. 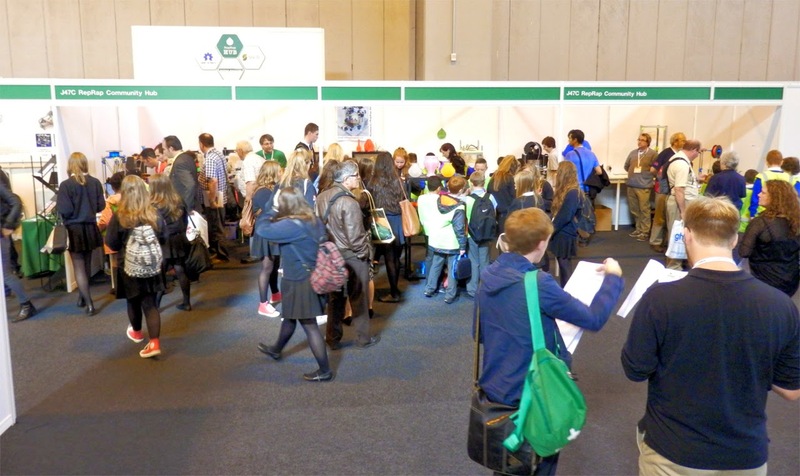 This year the show was spread over 3 days and had 30% more floor space. 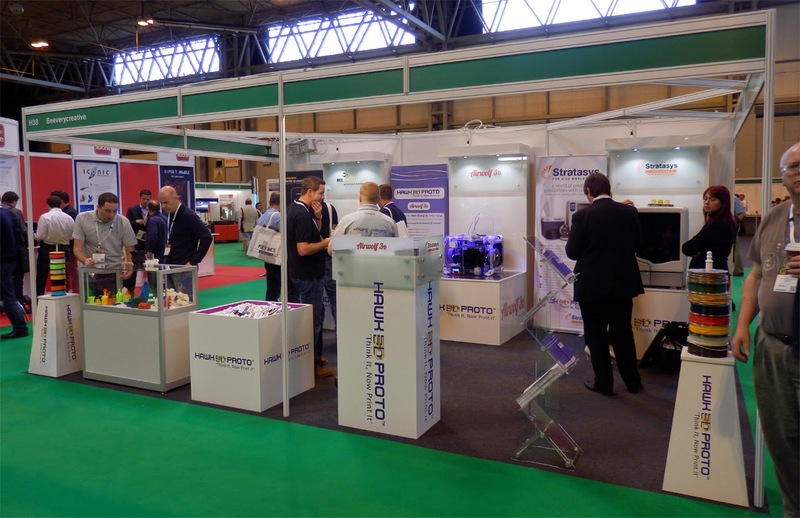 Combine that with an outstanding list of exhibitors, great speakers and a constant flow of visitors, it was a real spectacle in the 2014 3D printing calendar. And before I forget, I must say a really big thank you to the TCT Show organizers and everyone who helped out at the show, if I didn't mention you below, please know I really appreciated the help this year. It made all the difference. 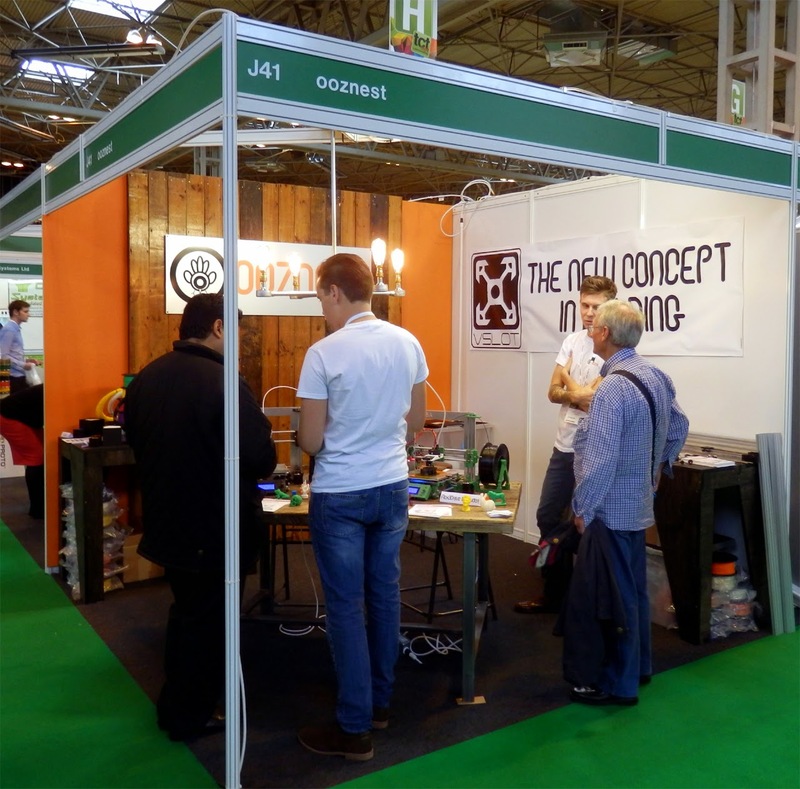 The RepRap Hub this year was dedicated to individuals and projects doing all sorts of work in the RepRap and Maker communities. This was also one of those shows that at the time is so busy, exciting and fun that you forget to take photo's or enough video. That certainly happened to me as I returned home, only to find I had missed a vast number of opportunities to capture those magic moment on film. I will do my best with photo's and video I have (some are only smartphone quality), and where possible also point you to other review's of the show to fill in any gaps. I'm also pleased to say that a significant number of exhibitors were adding attribution labels to their printed objects and designs. Last year I had printed little tags, but often people thought they were 'business cards' and removed them. This year all my labels were laminated and stuck directly to the printed object or design. 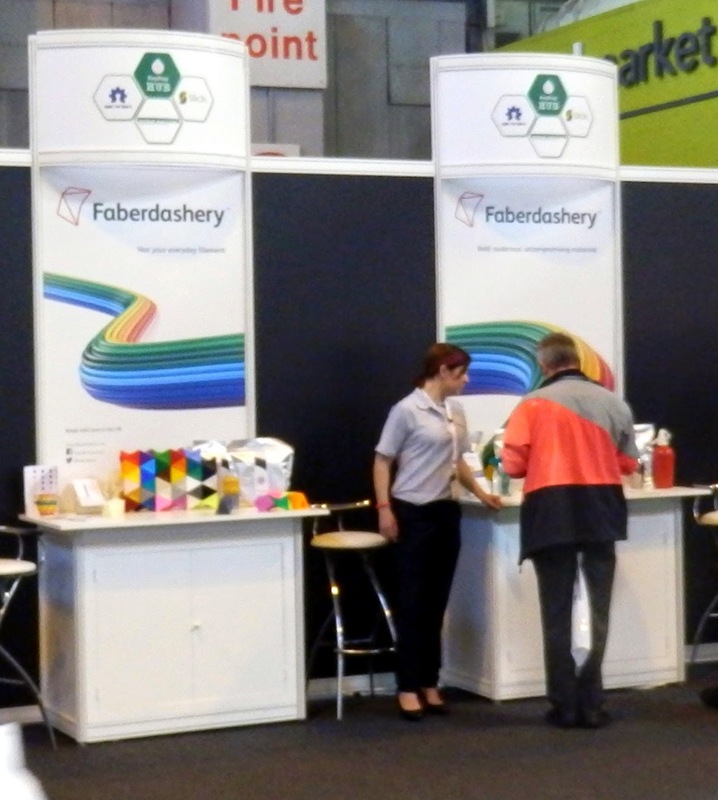 As usual setup day was the normal mix of chaotic and impressive stand builds, carpet laying and all manner of machines being setup and tested all around the show floor. Everything finally came together late on setup day and it was back to the hotel for a catch-up drink. 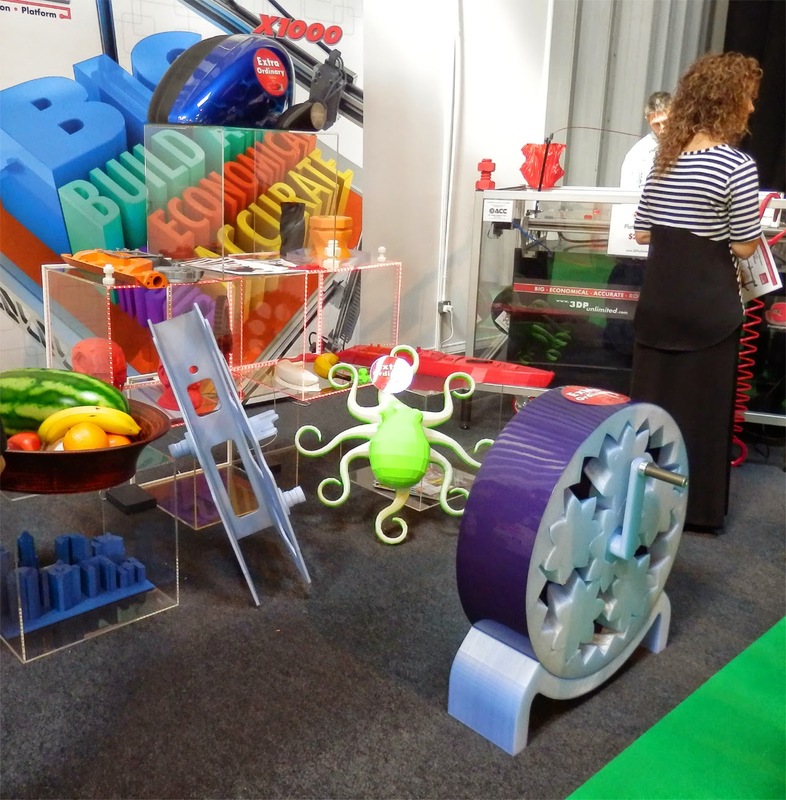 Some old, some new - I also printed a lot of example models and objects for various exhibitors around the show. I didn't want to swamp the show with all my machines, so I decided to only bring Sli3DR. 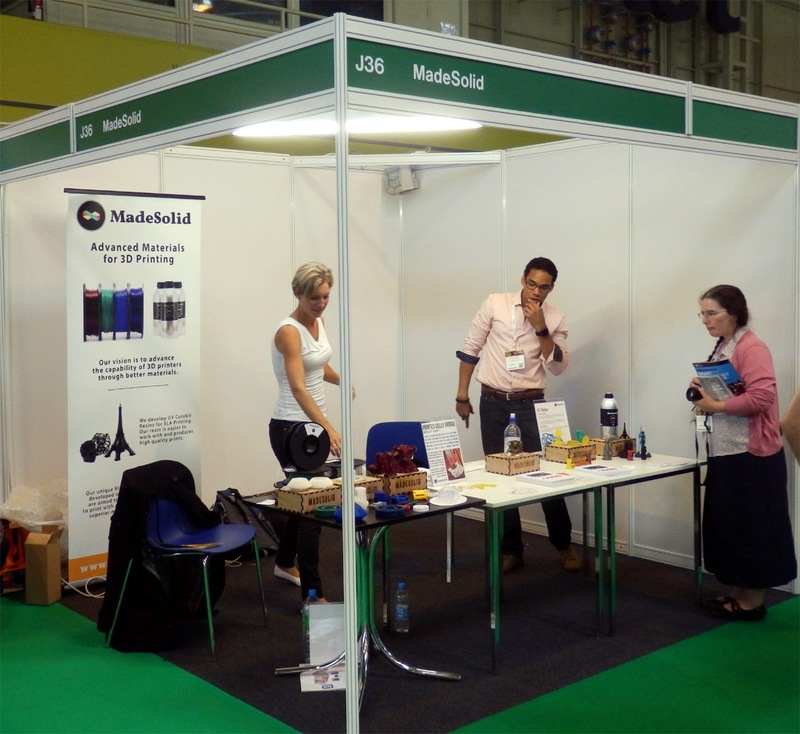 I did have my new 100ml Paste extruder project and the prototype pellet extruders on show. - I have a follow-up post on both of these soon, with a release of the files too. All these materials are using PLA as a base so they mix and bond perfectly together. I have done some work with 'real' mixing of Bronzefill and Copperfill with other materials, some very interesting and surprising results - more on that soon - I need to talk to Colorfabb first. This year was excellent for networking and catching up with people about the industry, it's such an innovative and thought provoking subject, every year more interesting people join the debate. I had a meeting of minds over breakfast with some of the great legends in the 30+ year established Additive Manufacturing (3D Printing) Industry. (Todd Grimm and Graham Tromans dropping two names) This was very good because it helped me get across some of the fundamental points of how Open-Source and 'Home' 3D Printing projects are being done, and also what sort of mindset these types of developers had about the already established industry and the direction of where it's heading. 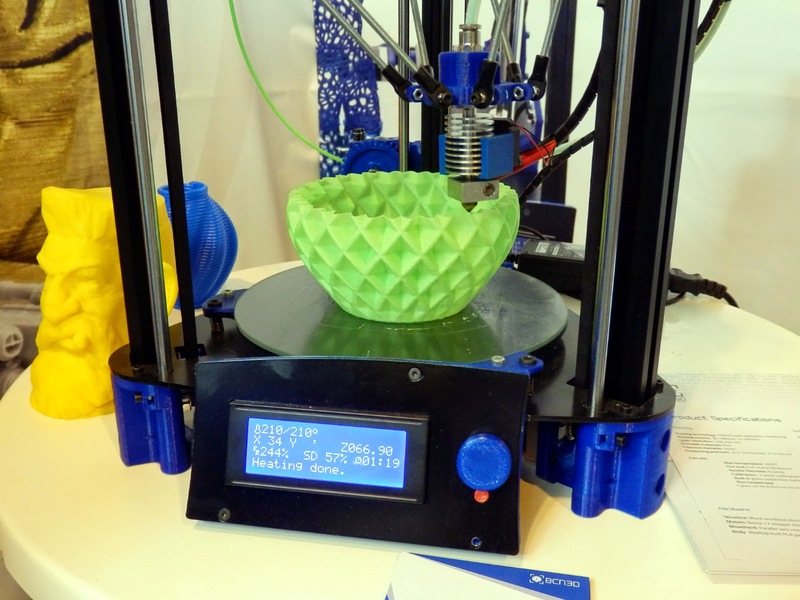 There is a lot more in common and in-tune with both established players (1984 -) and people who have entered in the second life-phase of 3D Printing (since about 2004). 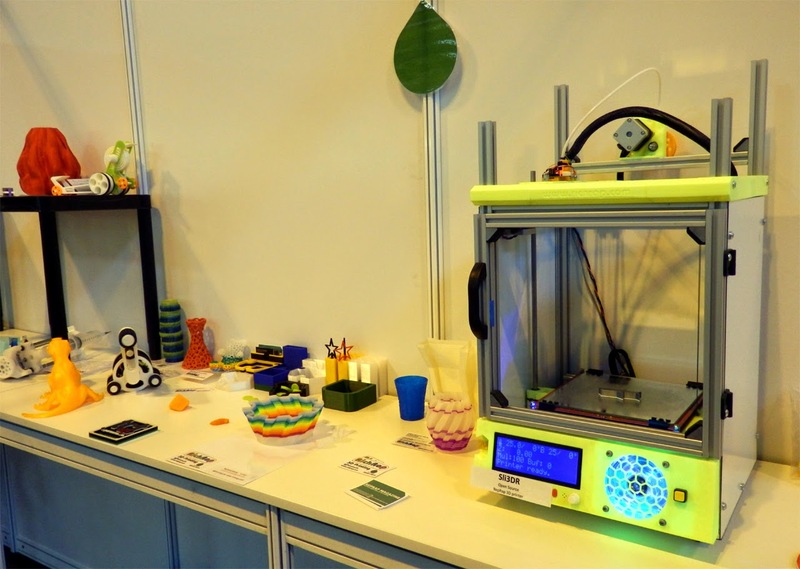 The differences and mis-conceptions still seem to come from the way almost all aspects of 3D printing are being represented by the media, and via some companies who operate on hype and dreams, with dubious misleading marketing. 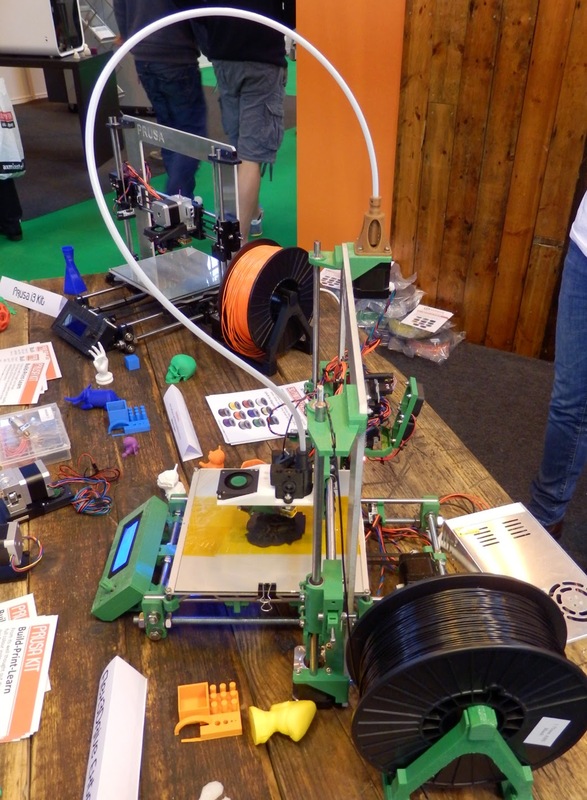 This year's RepRap Community Hub was big. 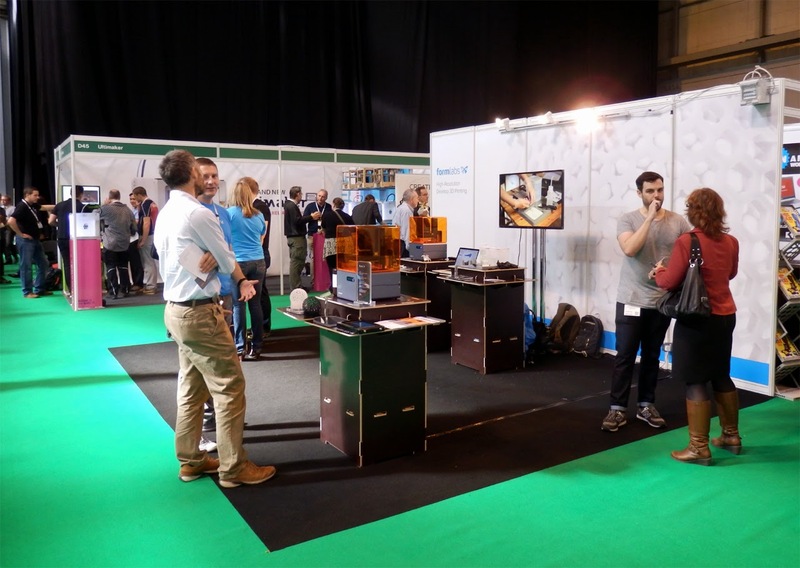 We had around 12 3D printers, some demonstrations only for a day, but a core of developers and interesting technology was being shown at all times. 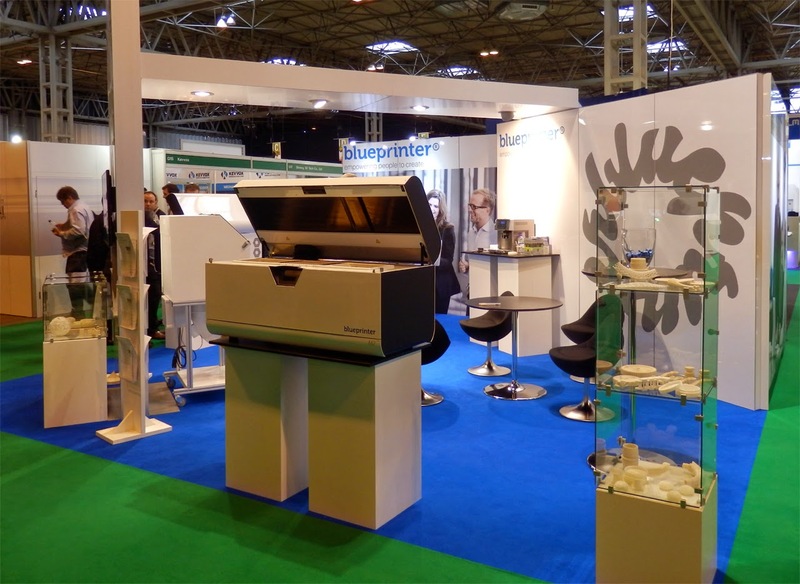 Andrew Wade had his professional RepRap Delta printer on show and printing for all three days. this is a miniature sized Mendel 90, ideal for travel and show's etc. Justin from Active 3D had machines and lots of other toys to play with. Justin's discussions with the various groups of School kids over the days went down very well too. Due to the busy nature of the show, I failed to get a complete group photo :( so here are a few individual ones. Just before opening on Day 1 - All setup and ready to go. Day 2 - We were flooded many times during the day, a very busy stream of visitors indeed. We had great questions and ideas from people of all backgrounds and with a view to using 3D printing in all aspects of business and hobbies. 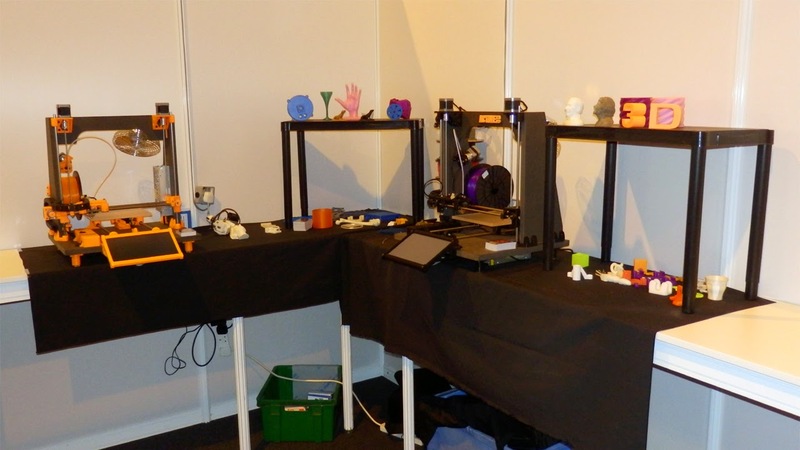 Hardly any questions about what 3D printing is and much more about what people wanted to do with it - some were very blue-sky thinking, most were totally possible. 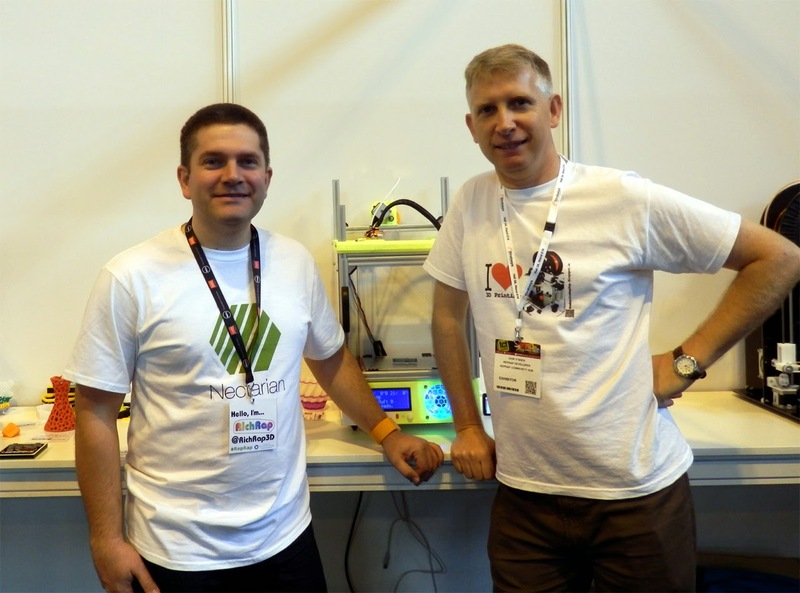 Thank you also to Laurent Muchacho and Hamish Mead for being part of the RepRap Community Hub and talking to so many people over the event. The event was a success because of people getting involved, so thank you all again. The Pods were a new idea for the show this year, and proved a great way to support the hub. Similar to the start-up zone, these pods were used to highlight new companies and products of interest with specific branding done by TCT. 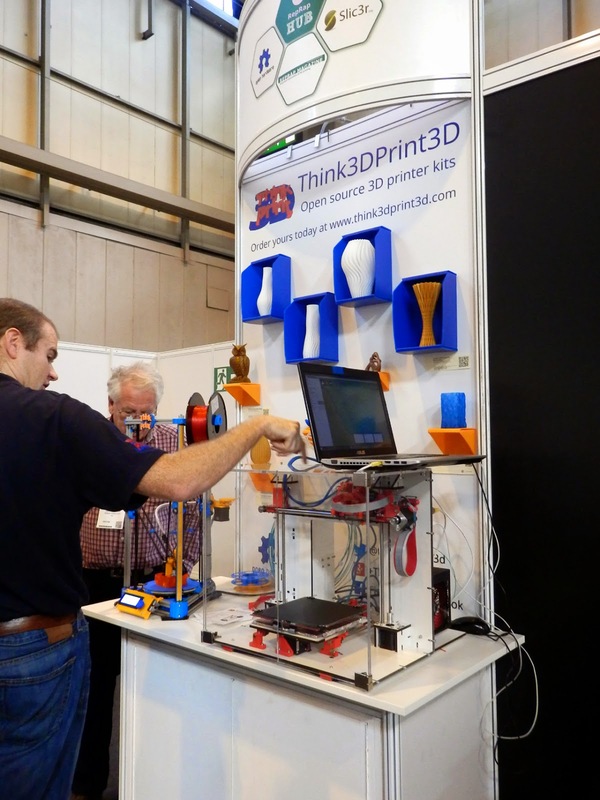 Tony, Roland and the Think3DPrint3D Team had a lot of good printed object to show. 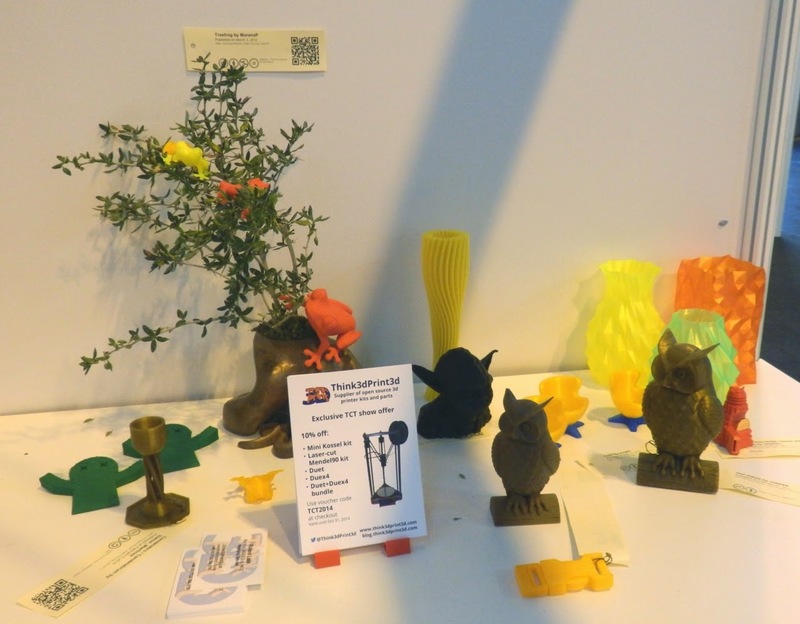 Along with adding a second Kossel printer to the Community Hub stand, they also made up a nice 3D printed scene, :- Note the tree frogs... in a tree. 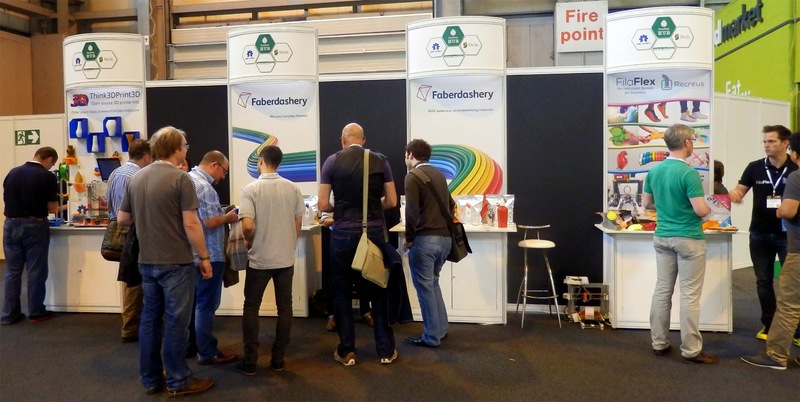 Had the fantastic Faberdashery - with all new branding and new translucent filaments. 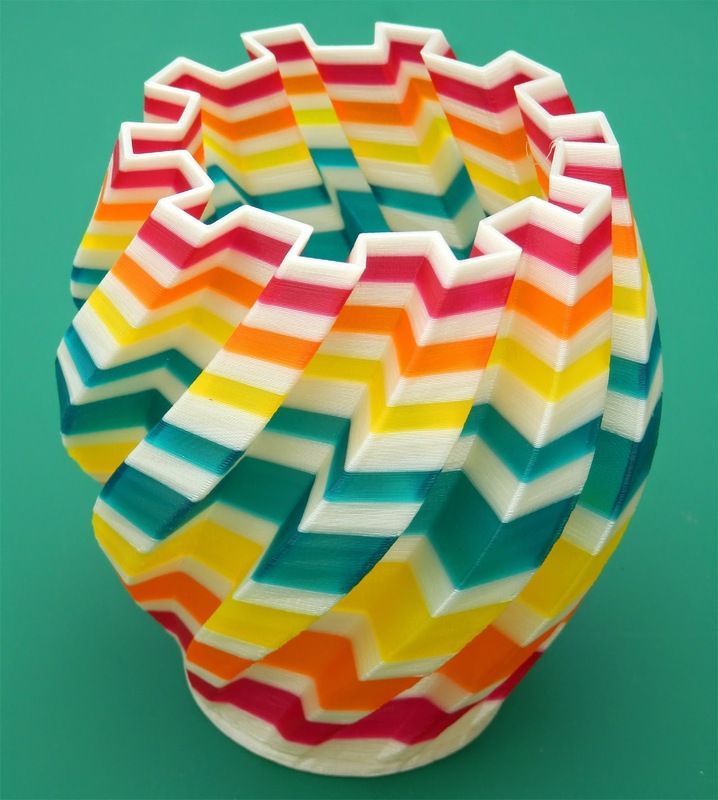 I printed a Gear Vase with the new Juicy Faberdashery filaments, check them out here. 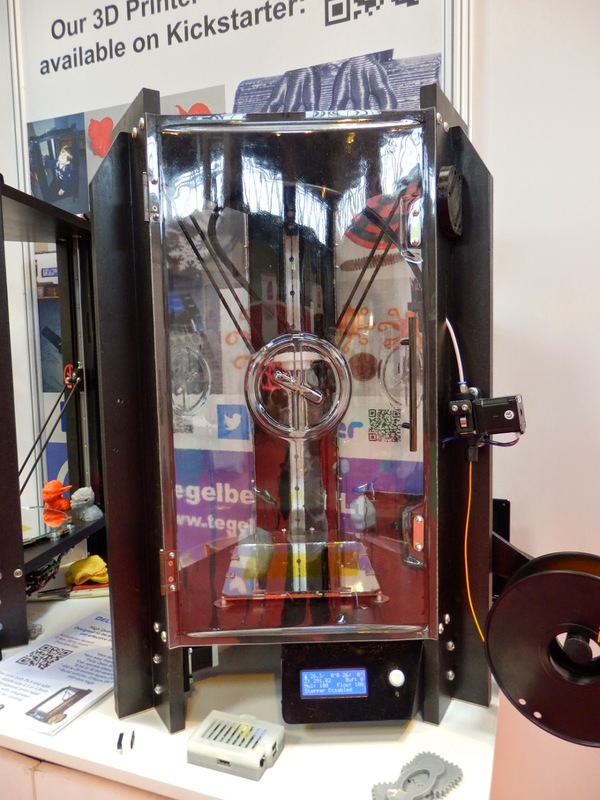 Recreus (Filaflex) Ignacio & Steve (Gyrobot) were demonstrating the fantastic flexible filament. Along with the filament, Recreus have been working on an all-metal extruder, this really helps hold the flexible material and allows it to be driven into hot-ends without getting jammed. 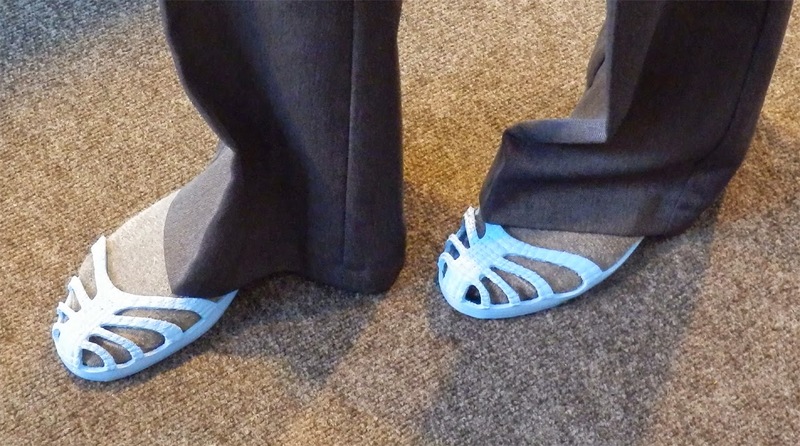 Ignacio and Mary both sporting 3D printed Filaflex shoes for the event. Around the edges of the RepRap and maker zone we had a lot of great companies, showing interesting technology and new products, here are some of the highlights I captured. The highly dedicated and knowledgeable E3D team (Photo by Gabrielle Tymkow). 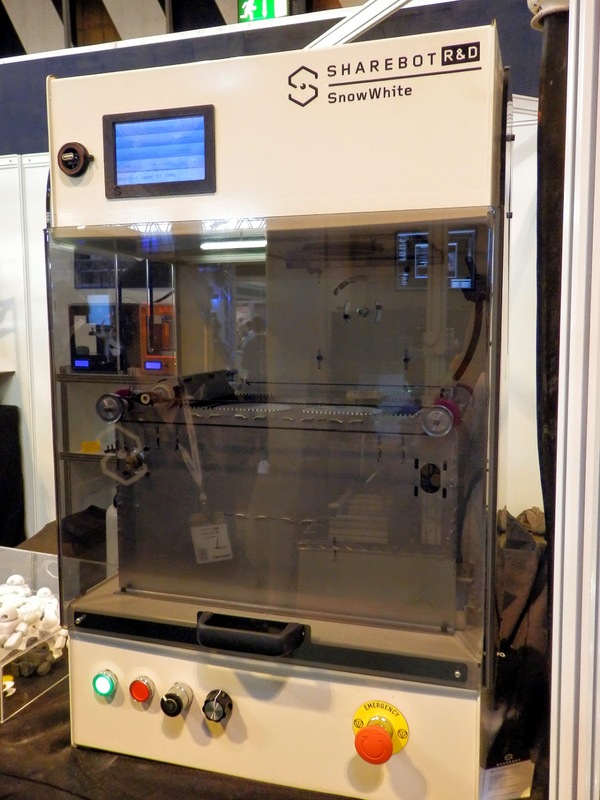 E3D - Makers of the amazing V4/5/6 open-source all metal hot-ends, had their whole stand dedicated to the tech that goes into a well designed product. 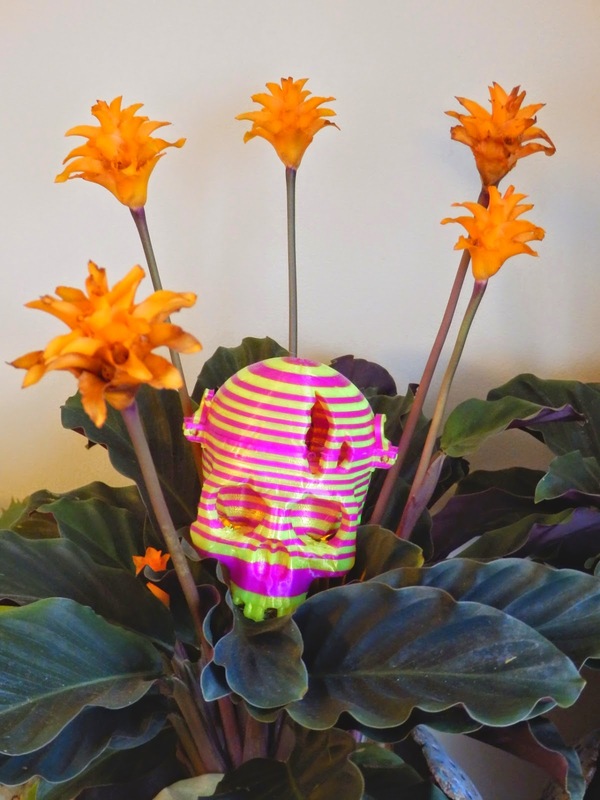 (even their stand design was 100% home grown). 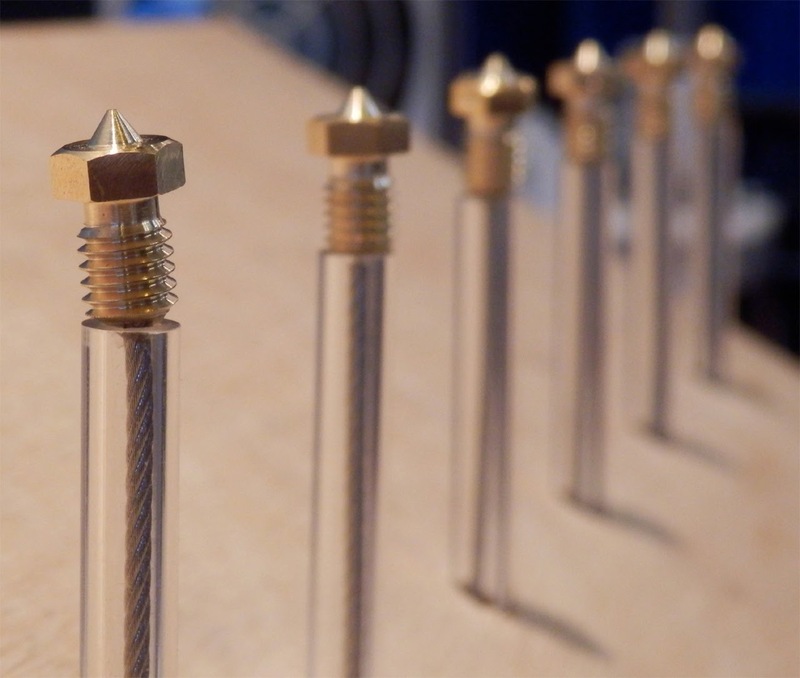 Being the perfectionists they are, I know this image of an E3D nozzle not being perfectly straight will bother them. And by the way, it was a great way to display their machined parts for close inspection. Talking to Sanjay (and I did a lot) they all live and breathe 3D printing. 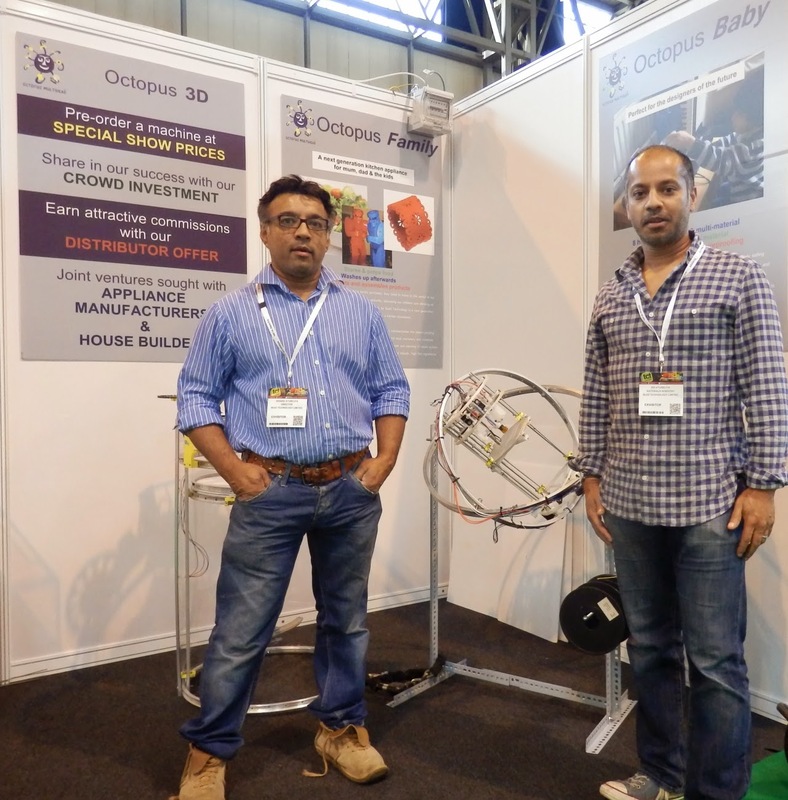 And not only that, they have a true determination to understand what's going on inside the hot-end and with the entire process of 3D printing, this drives them on to make ever higher performance products. 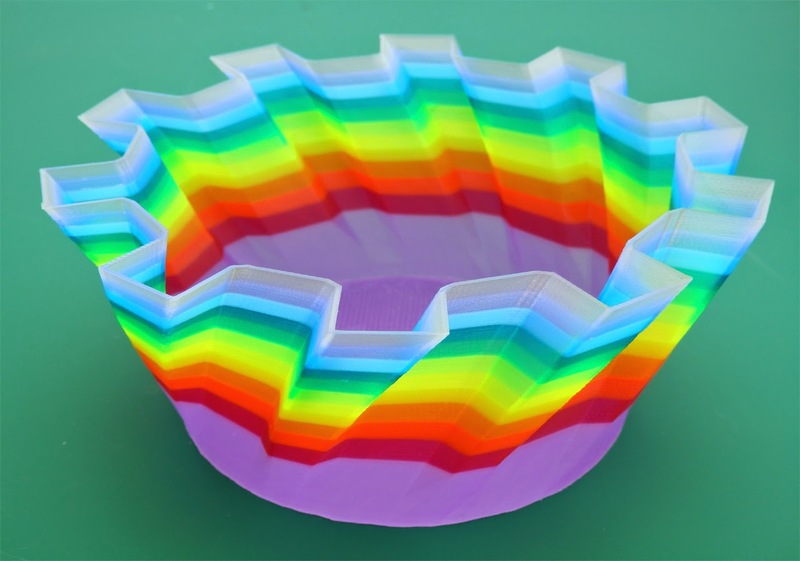 There is still much black magic still going on with 3D printing, and I feel so much better knowing E3D are investing time and energy to work out some of the more subtle aspects of materials and mechanical proprieties interaction. It's a lot more complex than anyone really understands. 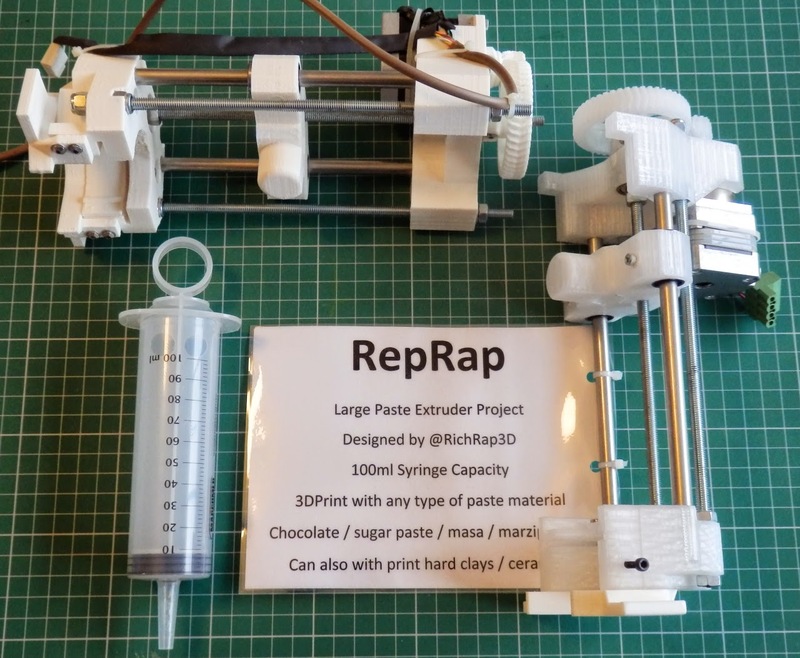 It would not be RepRap, without RepRapPro! 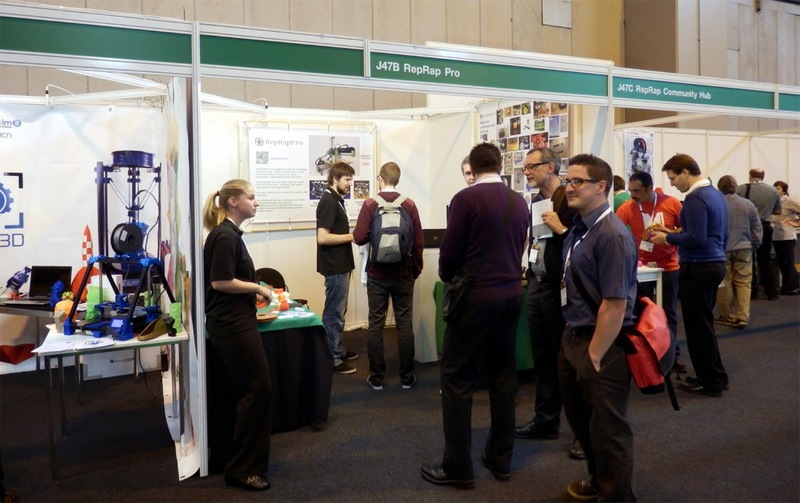 It was so nice to catch up with developments and meet the growing RepRapPro team again. 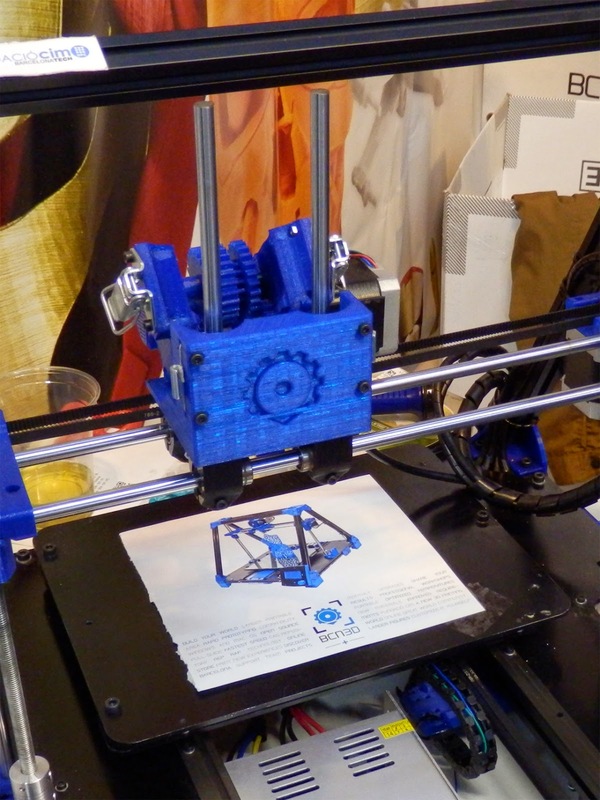 It was really nice to see the RepRap BCN3DR up close - this is a 'mass production' version of my 3DR delta design. Still combining RepRap 3D printed parts, and some laser-cut parts, for a very strong and solid delta. 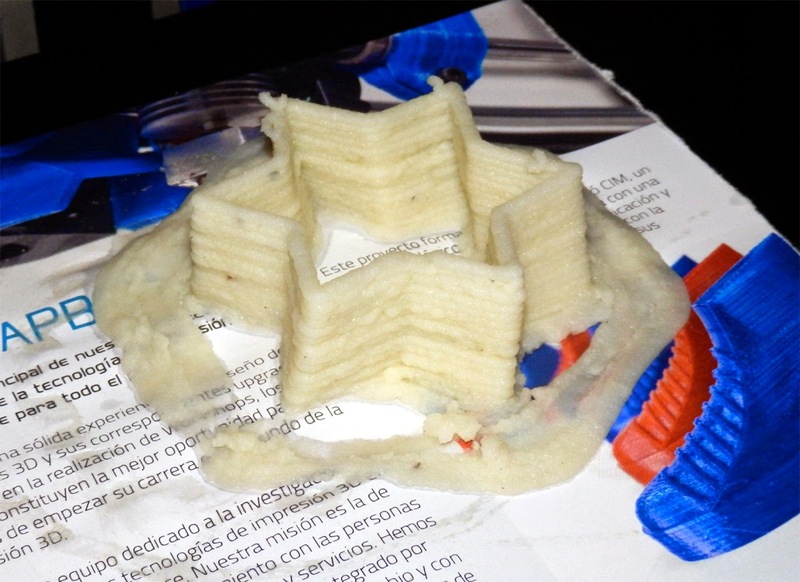 RepRap Barcelona were even doing live mash potato printing. 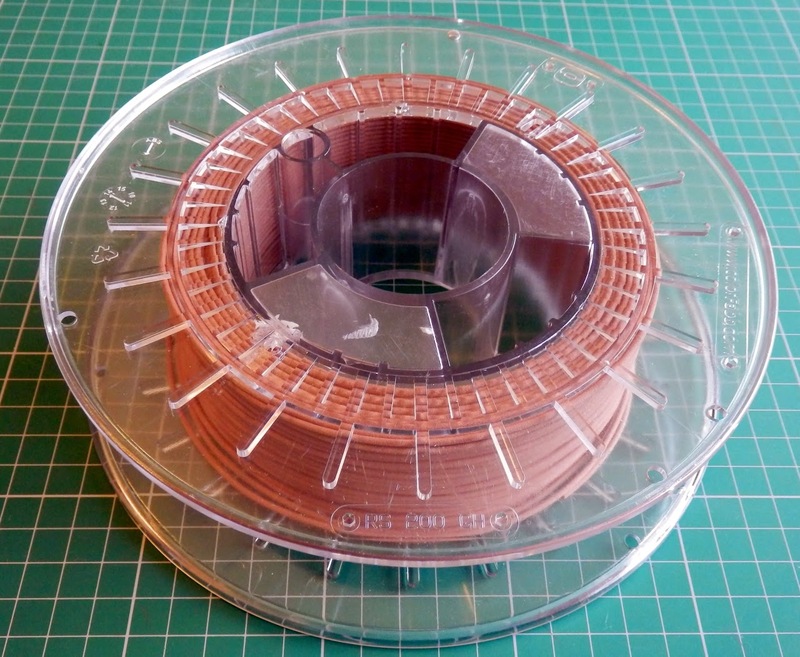 Colorfabb had new Copperfill on display along with the coloured Amphora _XT materials. 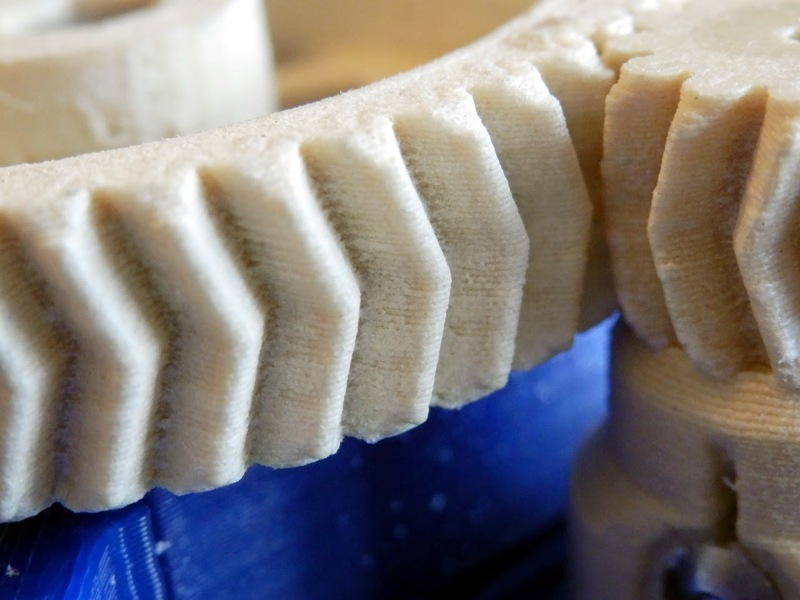 It's a very nice material mix for any moving, sliding or meshing parts, first test with gears is showing very good results - low noise, good fit and excellent wear resistance. Lots more on this material soon, but keep an eye out for an update as it's a really interesting product development. 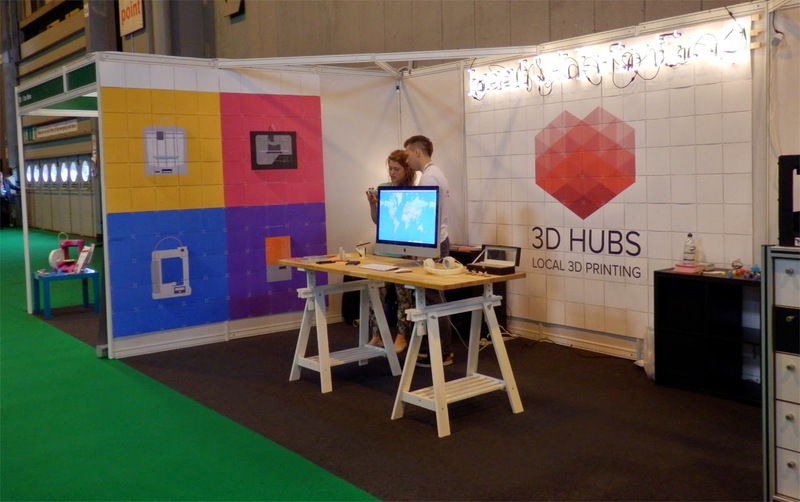 3D Hubs are rocking the world at the moment, lots of excitement and expansion planned from them. 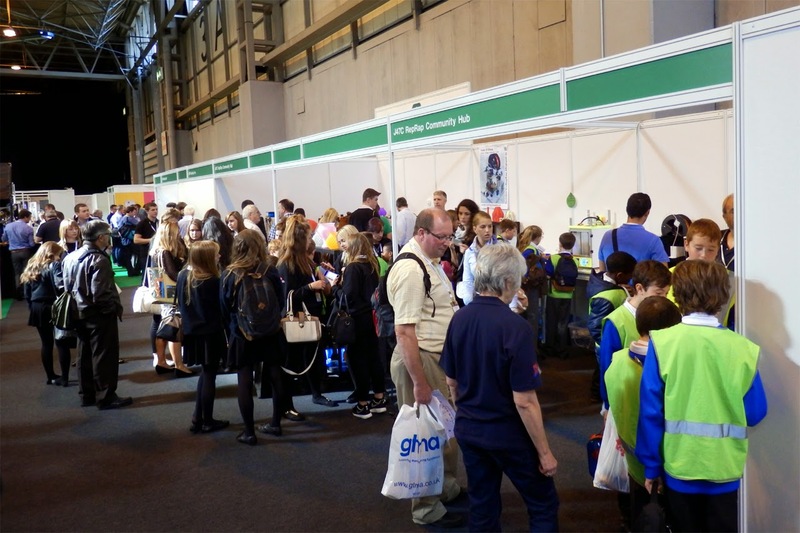 My favourite educational company I Can Make were next to 3D Hubs, Chris Thorpe was buzzing with excitement, infectious energy and passion for making. It was great to see pictures of Kids making up working and operational London Tower Bridge kits, whilst being inside the bridge itself. Their launch is coming very soon, do keep an eye on them. I Can Make are really one to watch in 2015. 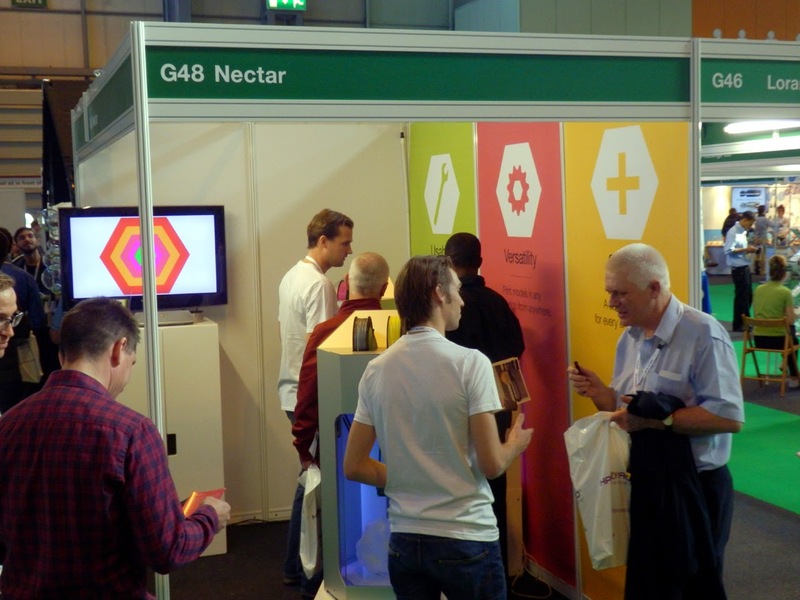 The Nectar3D crew from Holland were over at the show to launch the new 3D Delta Printer. I have been working with the Nectar3D team for over a year, assisting with the design and technology inside the Nectar One. This was a really interesting project to work on as it incorporated the skills of more than 26 people all around the world to get it ready for the TCT Show Launch. 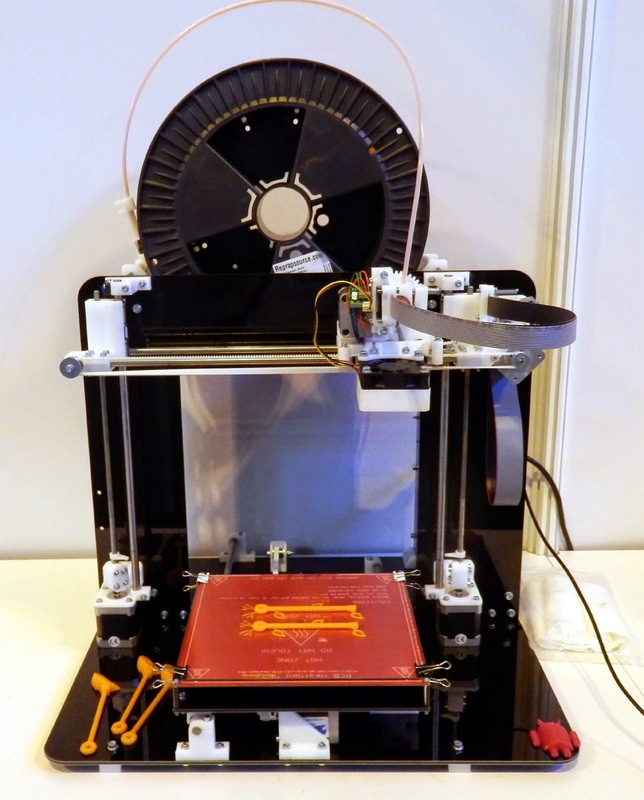 It's a professional machine, not RepRap but still an all open source project. Plenty more to share about this development as time goes on, you can check out the printer over on Nectar3D here. and I'm interested in any feedback you have. 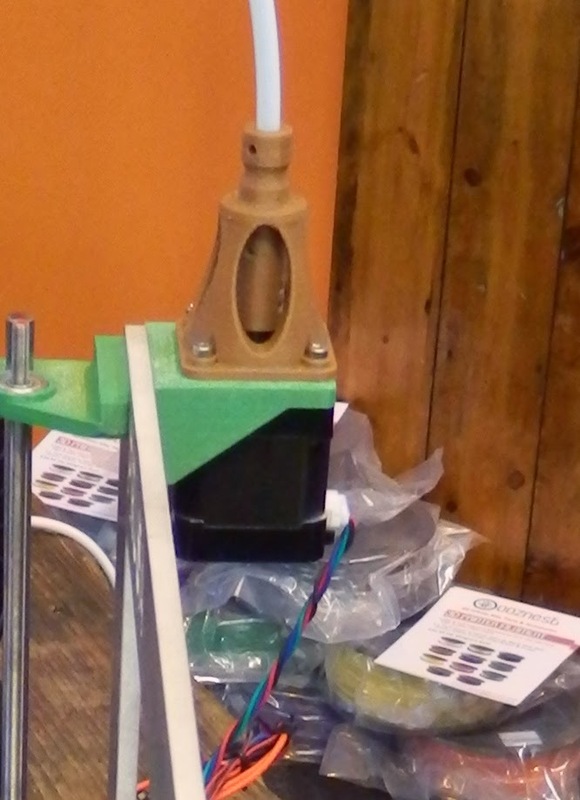 Probably one of the worst shots of a Nectar One 3D printer you will see, but with the protective plastic removed it's quite a fantastic machine. 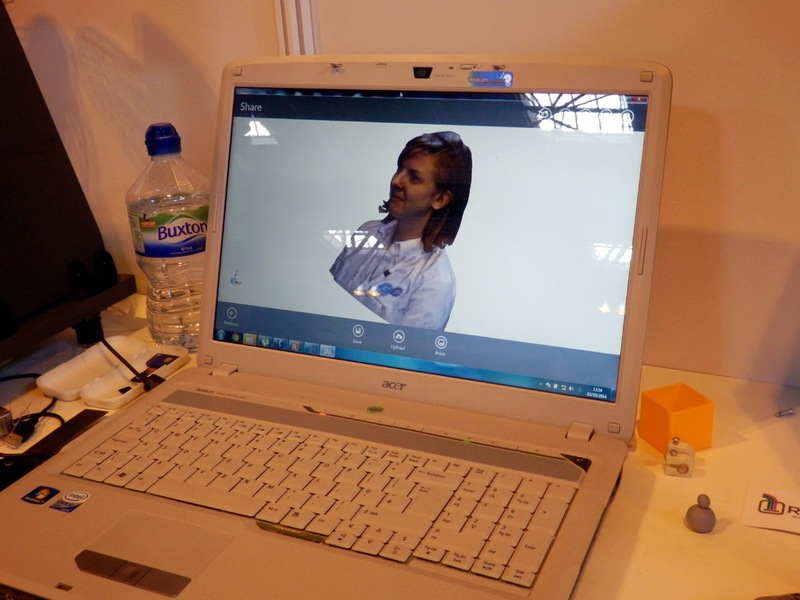 Printr were also demonstrating their very capable 3D print software. 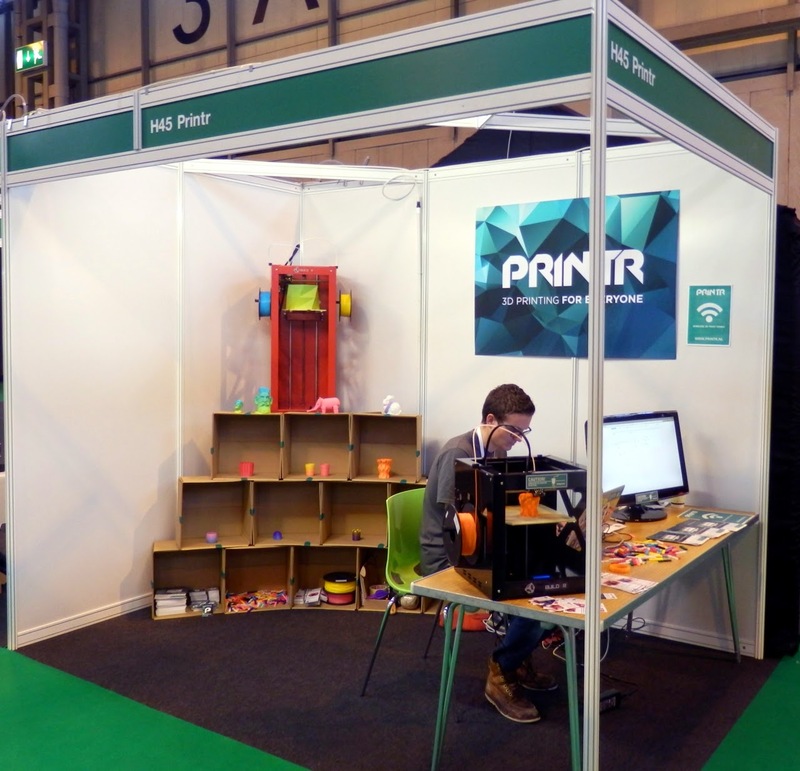 Printr have partnered with Nectar3D as a software platform provider for the Nectar One printer. 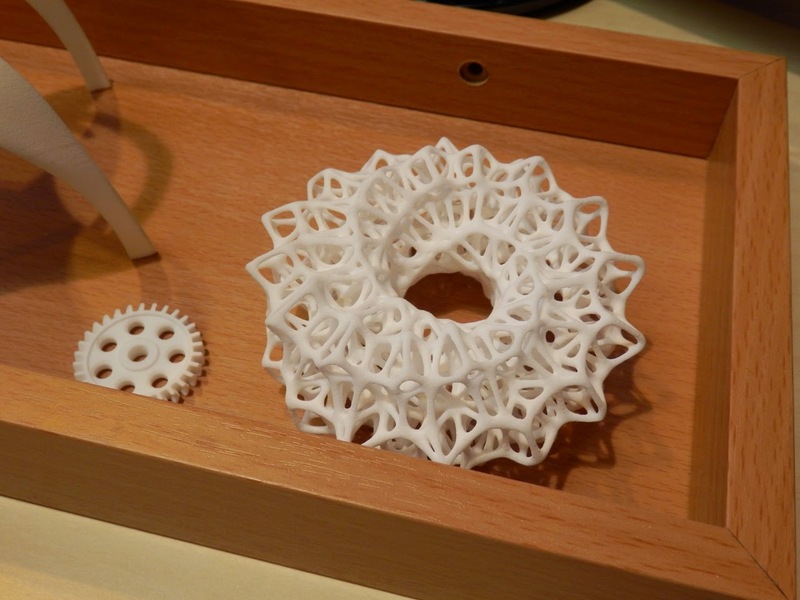 Ooznest had a nice collection of components, 3D printers and materials on display. One rather nice Prusa i3 machine had an odd arrangement on the extruder, it attracted a bit of attention while people worked out what was going on. 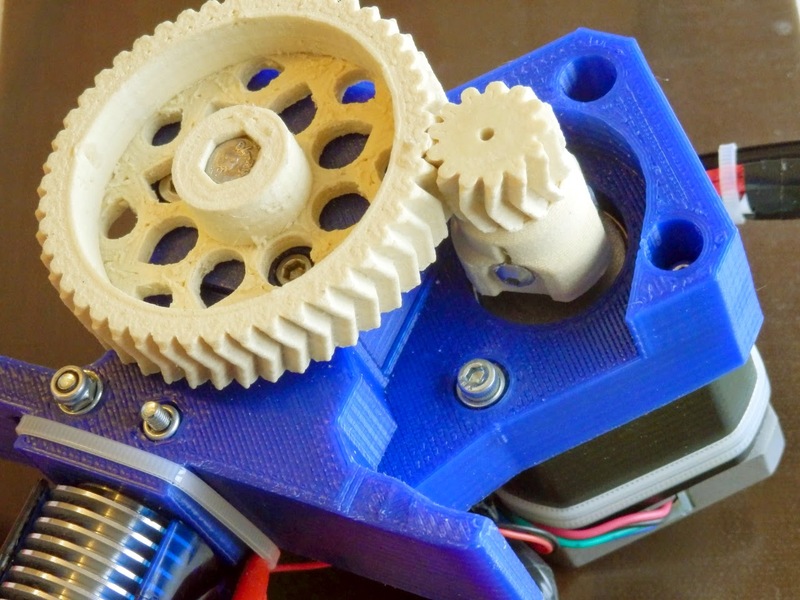 A flexible drive shaft (similar to the types Dremel use) was being used to 'Bowden drive' the filament pinch wheel drive gear - taking the motor weight off the carriage but also giving almost direct drive results. This was a nice setup, not that it solves all the problems, but a different way to do extrusion. 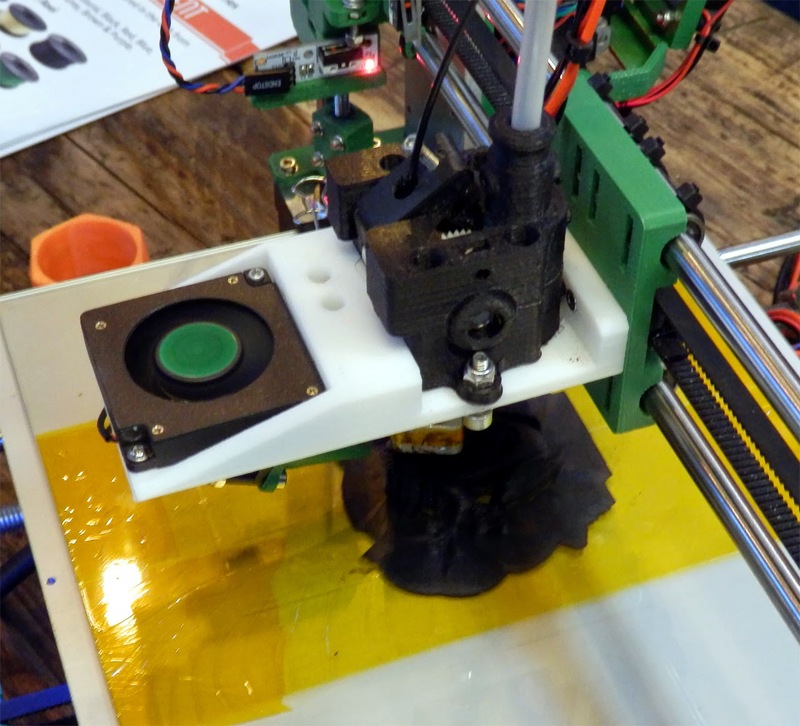 The Stroodler team were showing their desktop filament maker, and it was working really well. 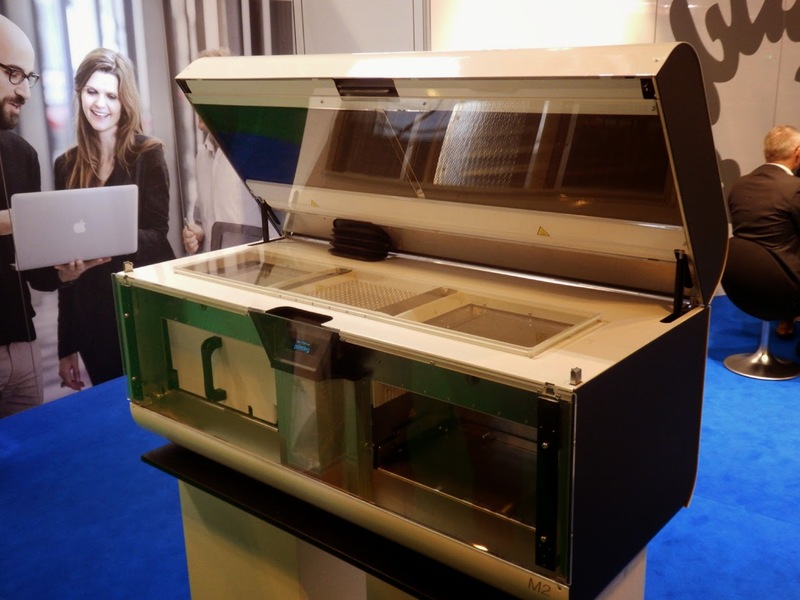 It was great to catch up with Richard Tegelbeckers of Deltatrix The printer is doing well. LASERS ! 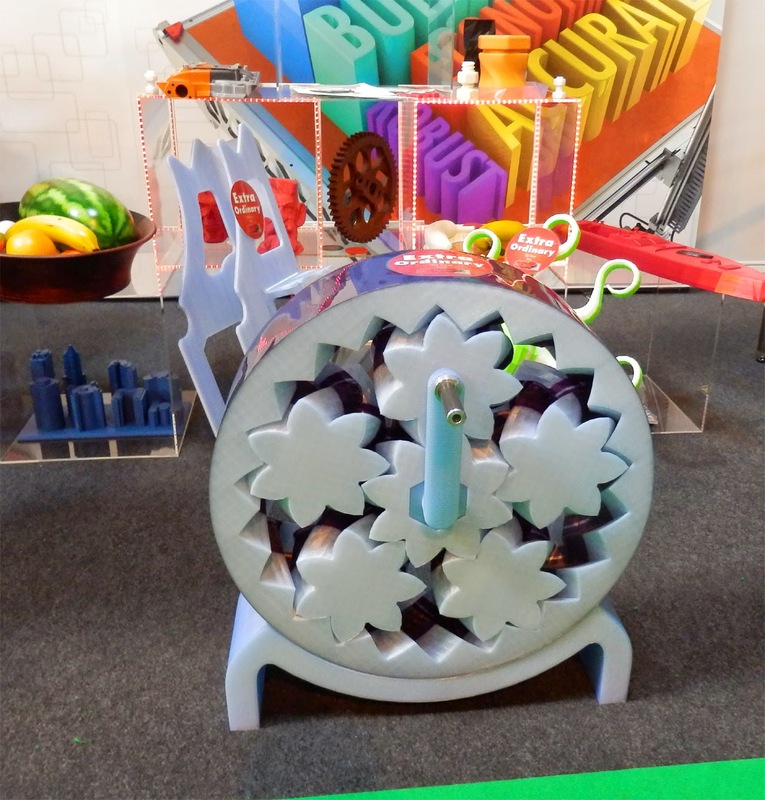 and printing with sugar, very nice, I really want one. 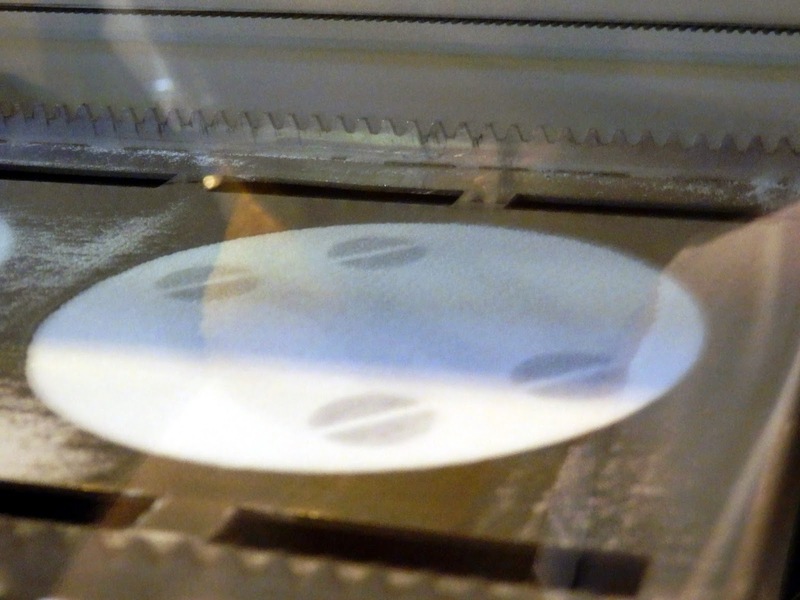 Snow White sintering Nylon powder. 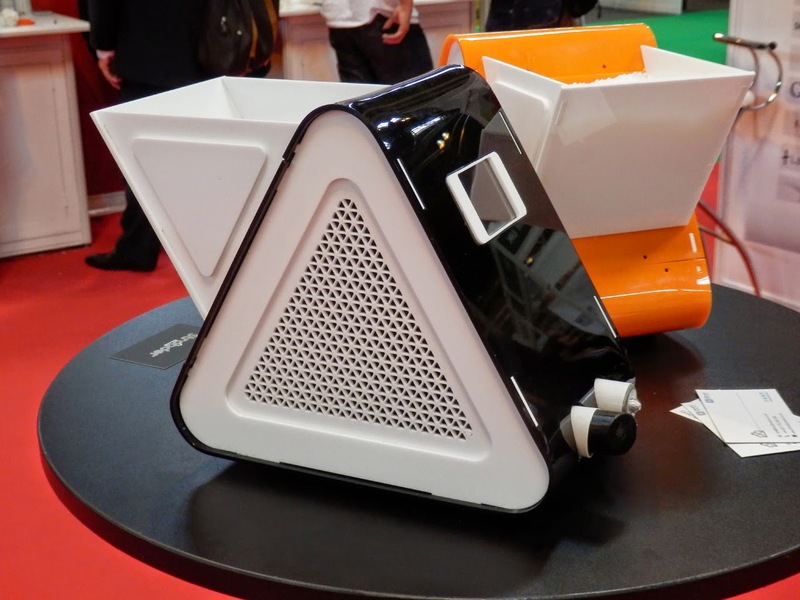 Norge is one to watch, although they had a failed Kickstarter, many people are interested in seeing this 'low cost' SLS sintering 3D Printer come to the market. Yet another SLS sintering system is the Blue Printer, it's looking like a finished product now. 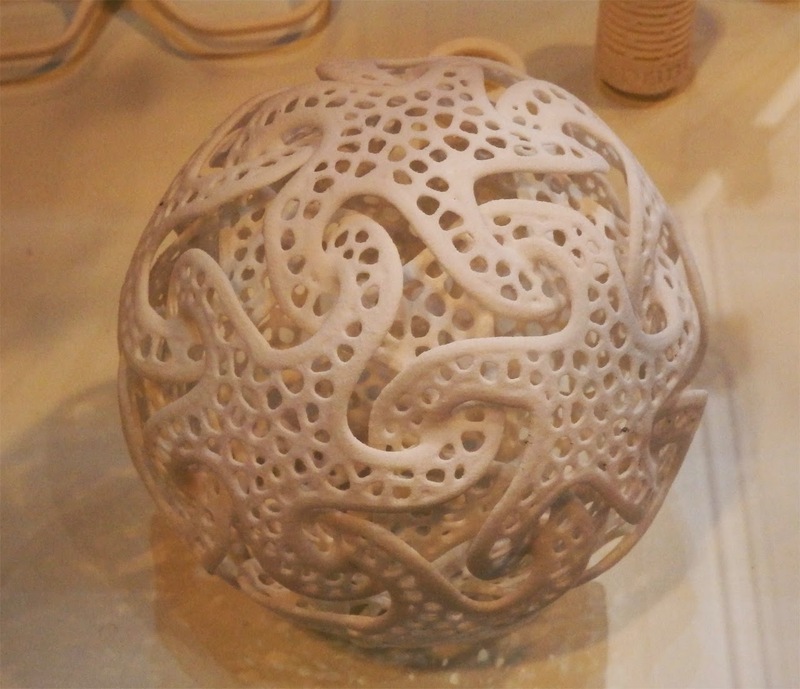 They had really nice printed objects this time around. Getting close to the same quality of machines costing 10x as much. 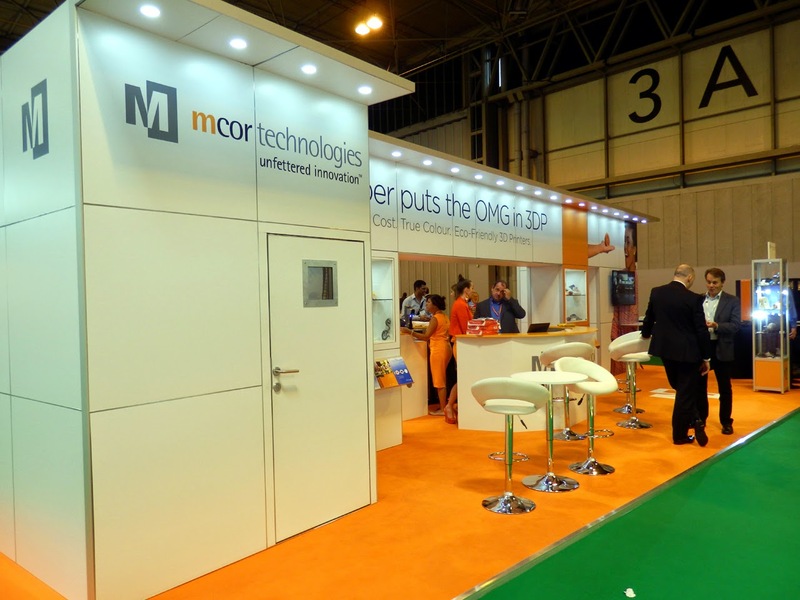 Mcor had an impressive stand and the iris paper based printer always attracts a crowd. 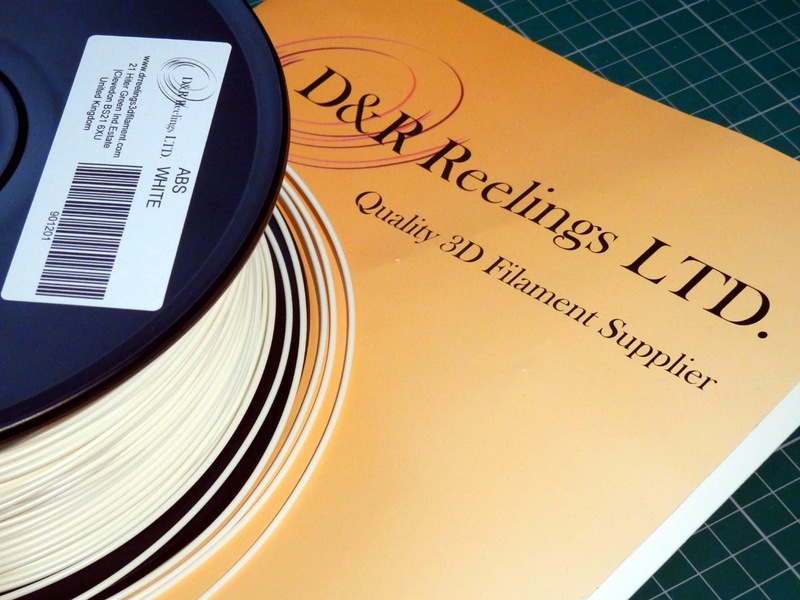 3DFilaprint - have one of the biggest ranges of filaments in the UK - representing manufacturers around the world. 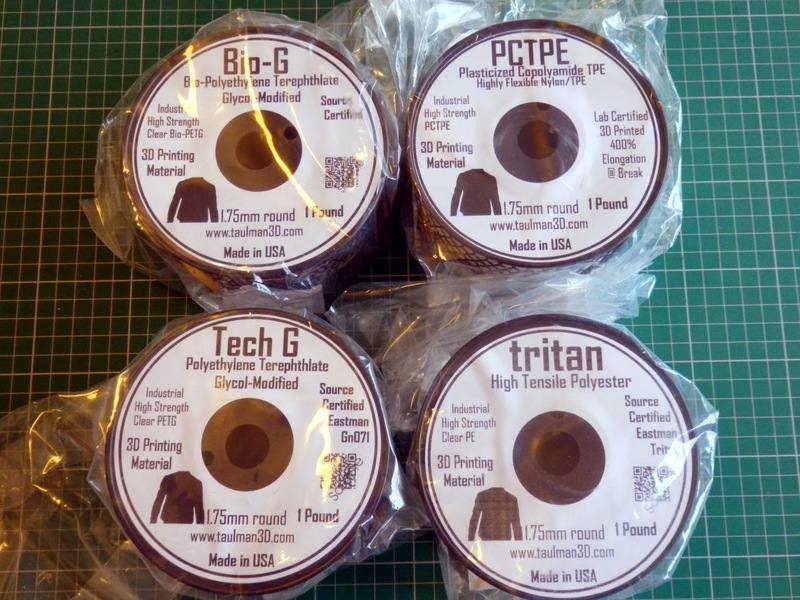 Their new initiative will go down well with anyone who likes to test out a new material (that's most of us) - They are promoting the Global FSD (Filament Sample Depot) concept - here you can get samples of filaments instead of buying a whole roll. 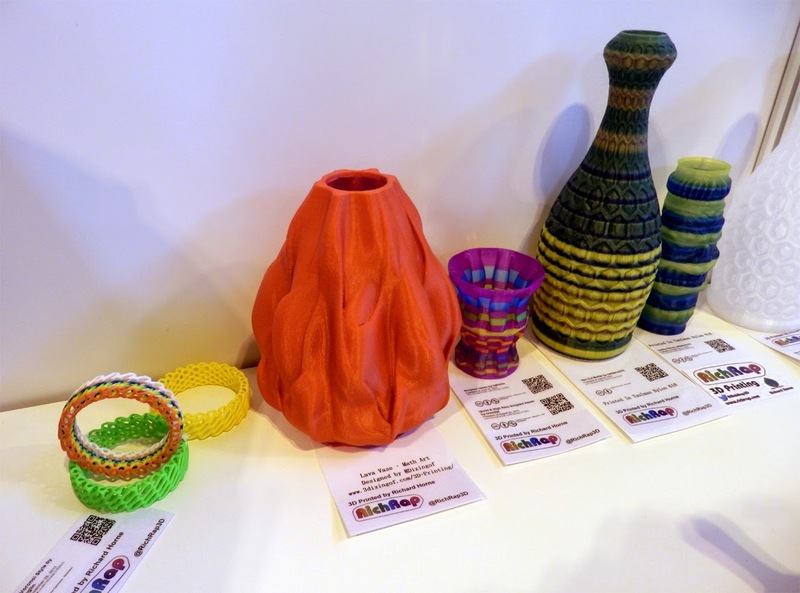 3DFilaprint represent Taulman3D and will be stocking Tom's new materials when available. 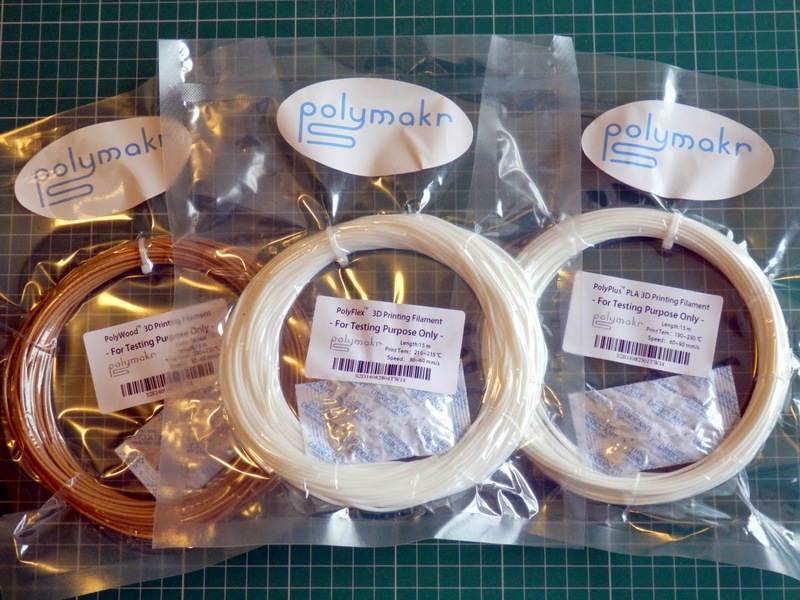 I was very lucky to get samples of Tom's new filaments before the recent Kickstarter. All I can say it that they are fantastic! 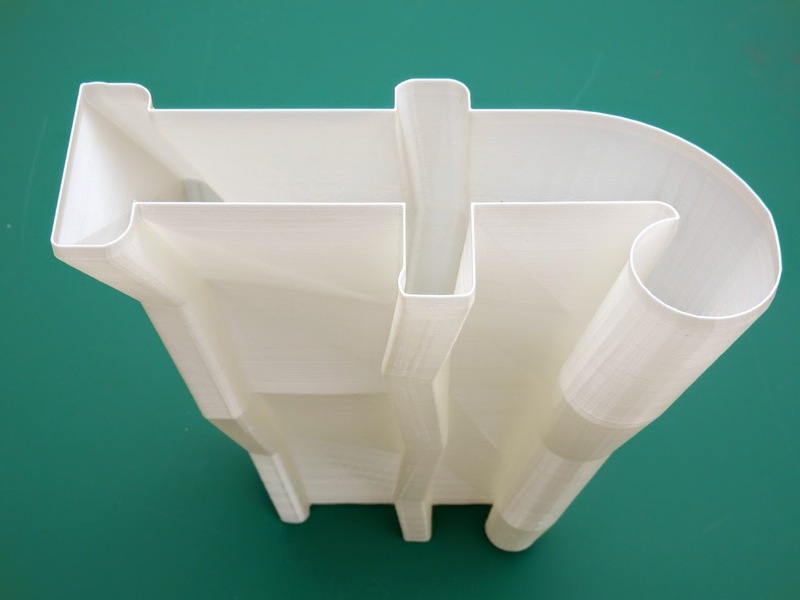 - especially Tritan - it's like Polycarbonate, but so much easier to print with. 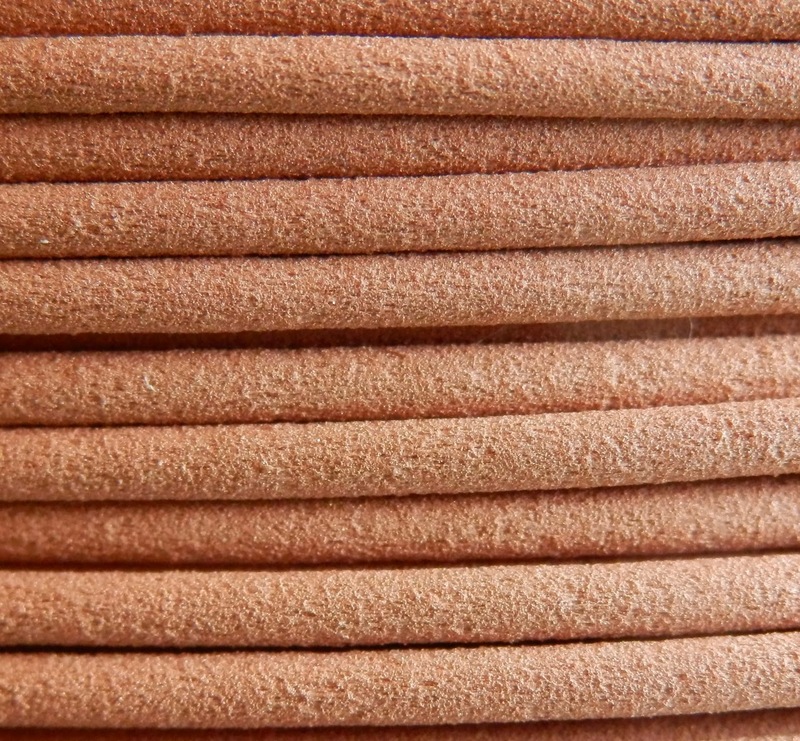 You are going to want to have Tritan on your list of must have materials for 2015. 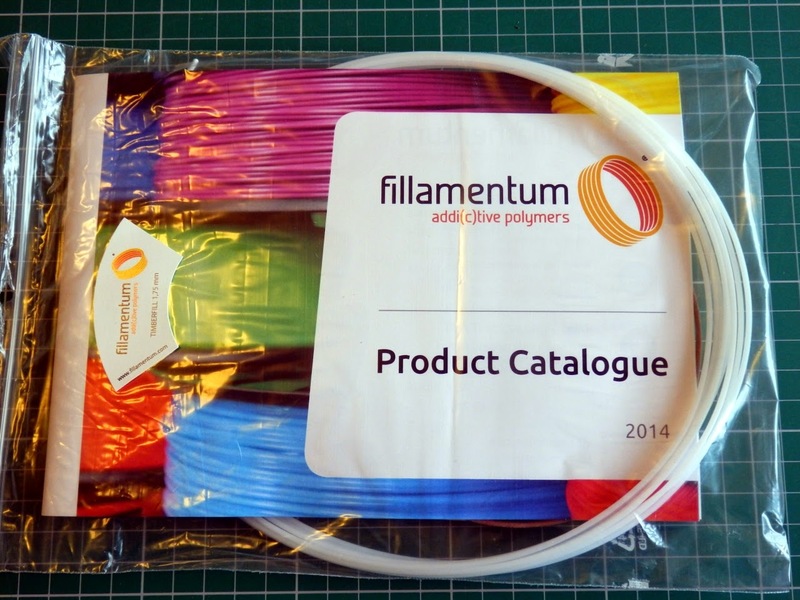 It was good to finally talk to Fillamentum, they have been around for years, but somehow I have not yet managed to try out any of their filaments. I will be testing these with interest. 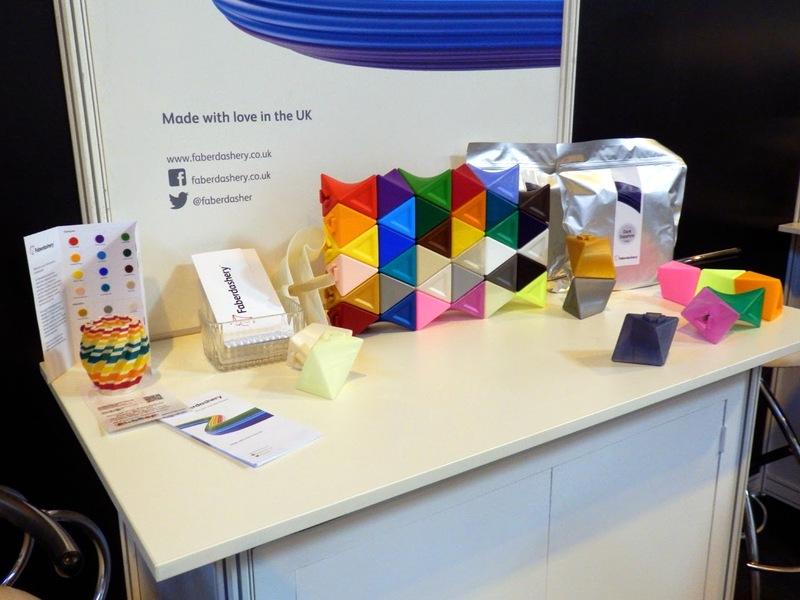 eSun were at the show promoting their new filament cleaning material. This is designed to clean out your hot-end if required or when you change over from one type of filament to another. I didn't get a full explanation of what the material is, so I'm a little cautious about using it (especially at 280 degrees C). But I will let you know how it performs. eSun had a nice sample pack containing most types of material in use today. 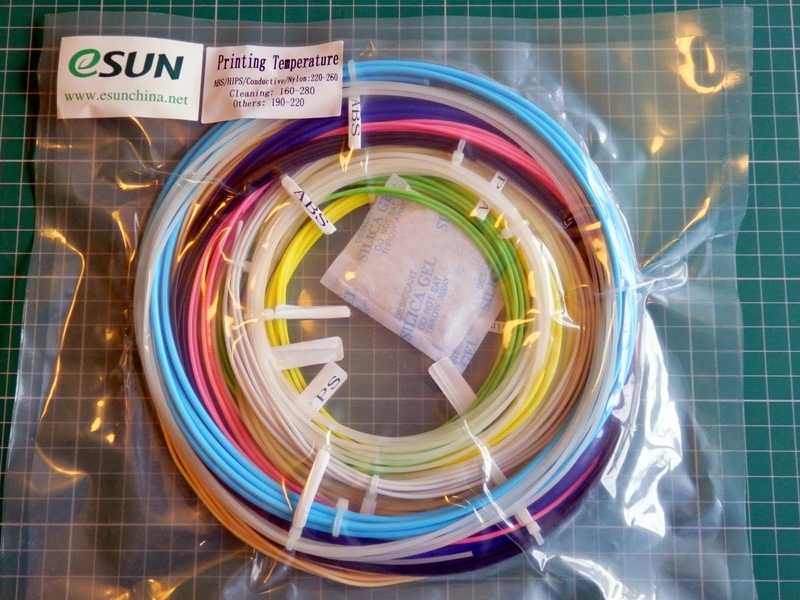 I have not used eSun filaments since my now famous/frustrating 'ball bearing incident' of 2012 They seem to have moves on considerably since those issues. I'll report how they print in a future blog post. 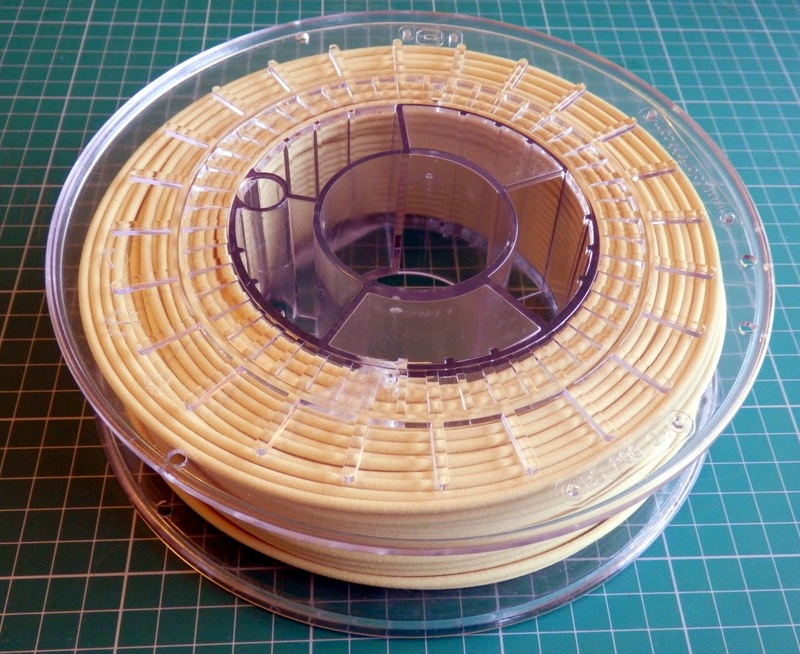 FilamentPrint - Another first for me as I have also not yet used FilamentPrint materials. This is a very small diameter roll, but I'll give it the benefit of doubt and try it out and let you know how well it prints. 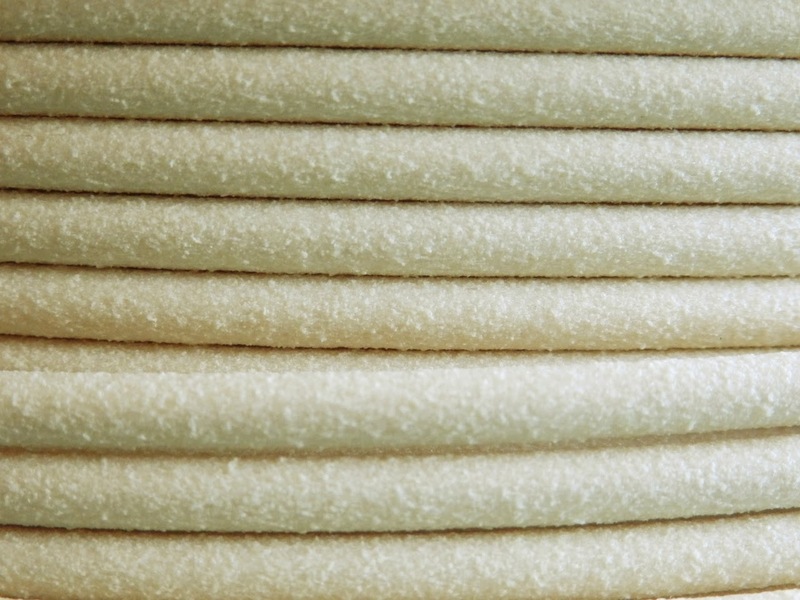 I do know one of the big names in home 3D printing uses this material, so it should perform well. 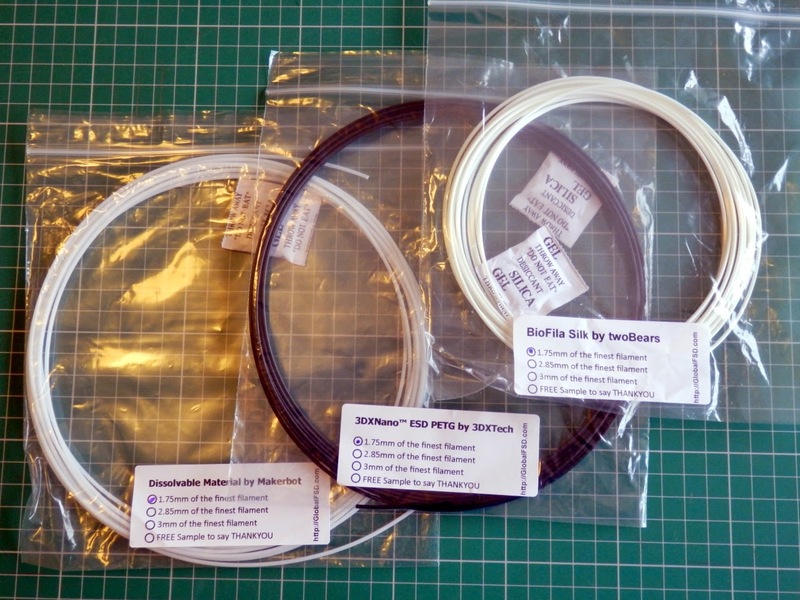 I have been using D&R Reelings ABS filament since meeting them the previous month. 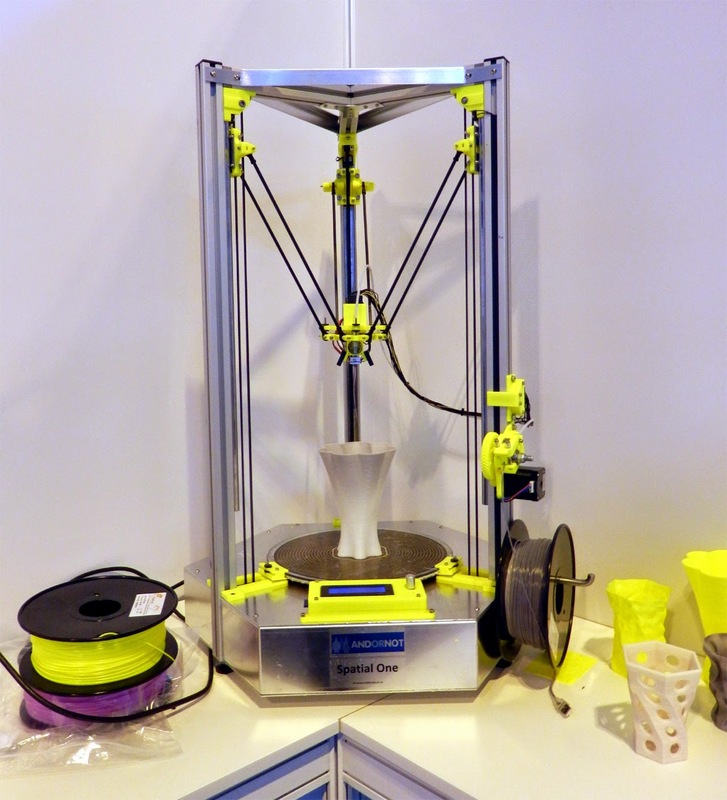 They are expanding the range to include PLA, Acrylic, Polycarbonate and Nylon. D&R have good colour consistency across materials - so ABS Red is the same shade as PLA Red. I can also safely say that their ABS is the best I have used to-date. Giving smooth results, solid colour and very good dimensional accuracy with prints. If you use ABS a lot, consider trying it out. 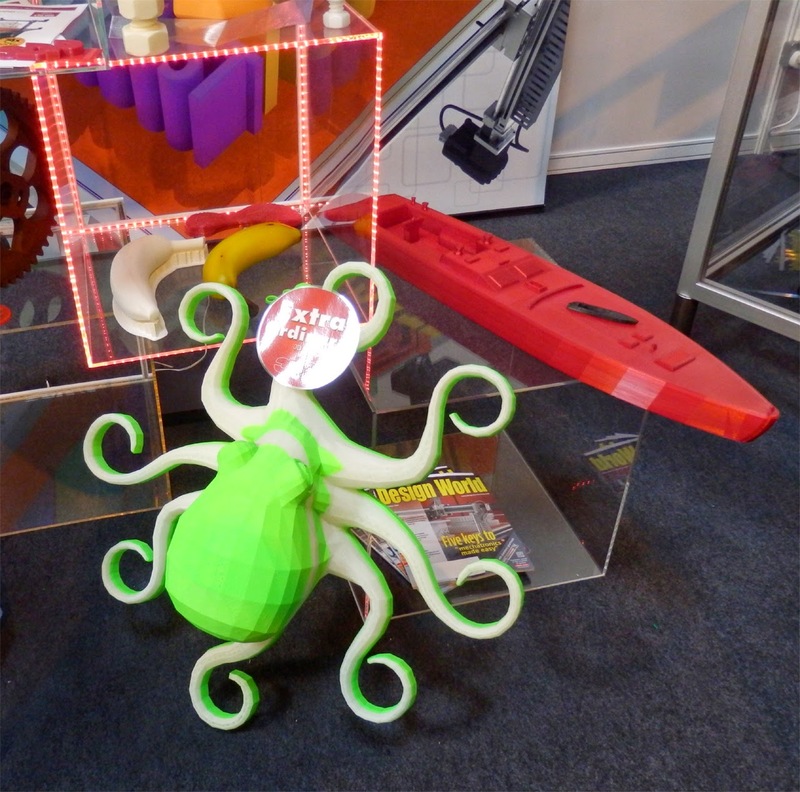 Ninjaflex from Fenner Drives - they were not directly at the show, but being well represented by E3D and 3DFilaprint. 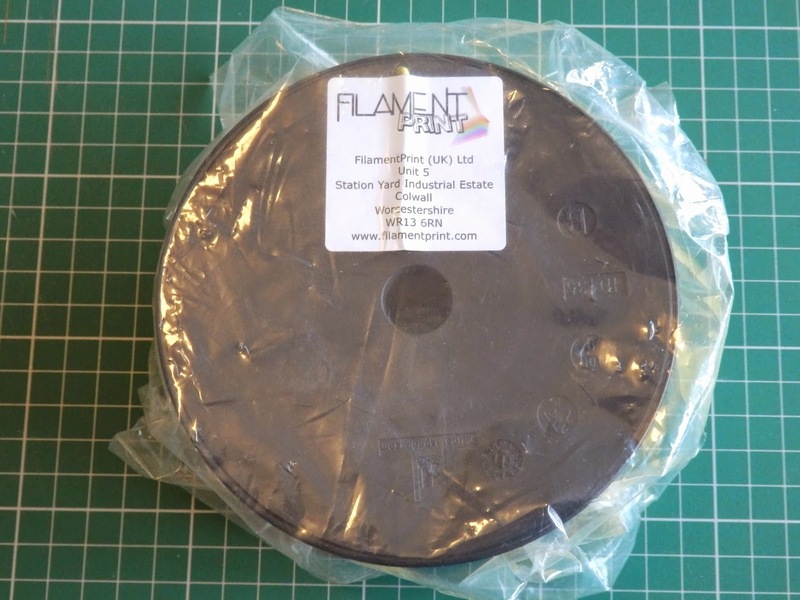 It's a good quality filament and it also looks like someone at Fenner Drives has now noticed that the 3D printing market can be a very good sector for them. 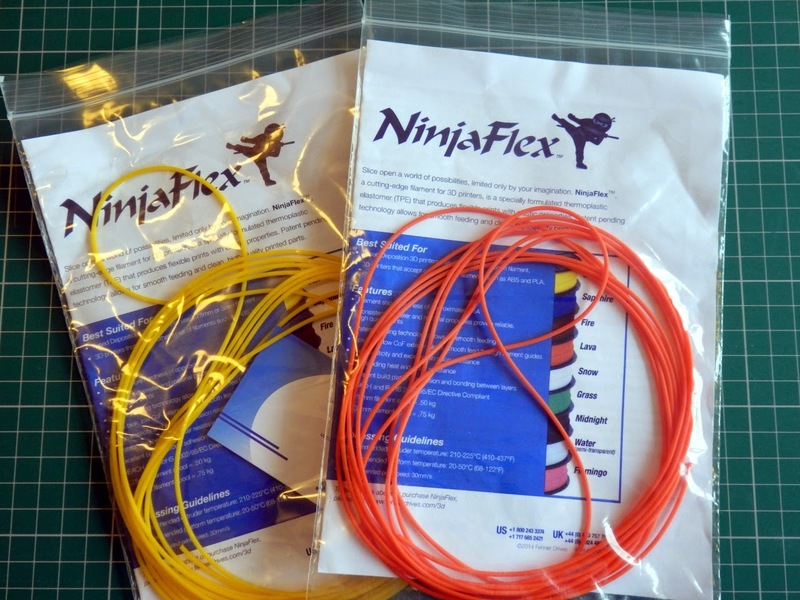 I'm sure we will be seeing a lot more of Ninjaflex in 2015. And Polymakr! - this was one I made a bee-line for, mainly because I had backed their Kickstarter campaign and had not yet received my reels of filament! - but they were very nice and I had a really good talk about materials. Polymakr also handed out a lot of material samples at the show. So I'm sure many people will be testing it out right now. I will be reporting on all their materials soon, I'm especially interested in how well Polywood works, it contains no wood... so, we will see. I met the Robox team, and I was really impressed; with both the machine and the team behind it. If you are not aware of Robox, do check out their machine. It has a unique needle valve design in the hot-end. It's a work of mechanical genius. They are also using a very nice bed material (PEI) that almost any thermoplastic seems to stick to, really well. Not only that, they gave me an off-cut sample of PEI to try out. Thanks Guys! PEI bed material courtesy of Robox. 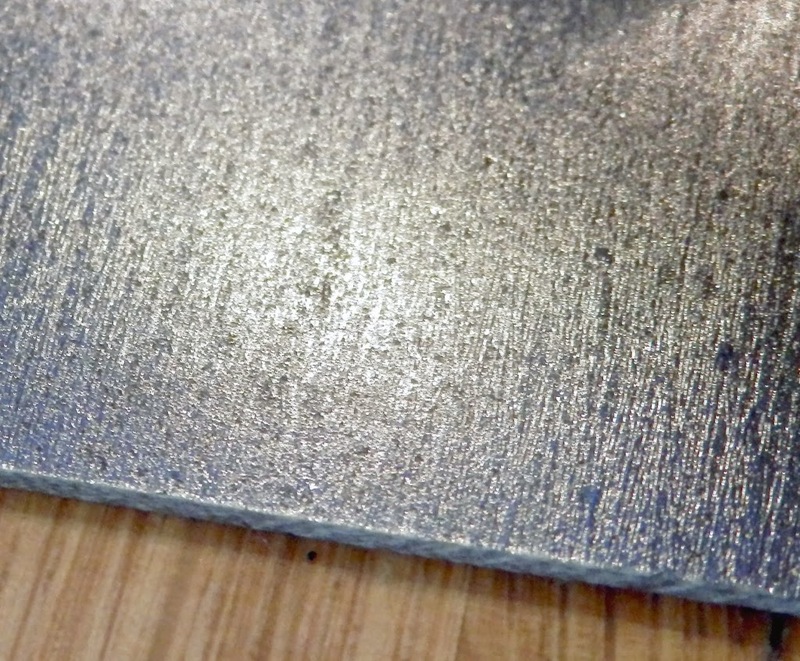 (more info here) It's a laminate material, something like FR4 PCB board or Tufnel. It's made of a thermoplastic resin and tends to come in thin sheets (~0.5mm), unfortunately it's quite expensive. 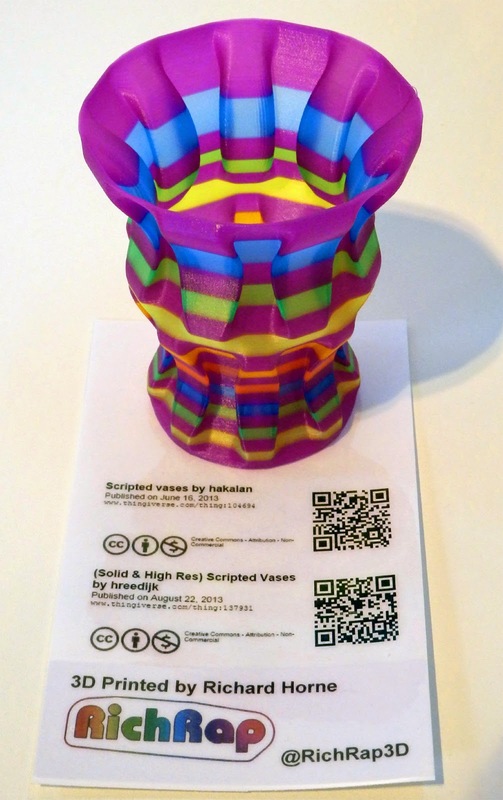 But I expect someone will get the volumes up, and then offer it out to everyone in the 3D printing community. We may all be using it by next year. I'm giving a shout out to We Do 3D Printing, because one week before the TCT Show, I switched over my 'new' 3D printer to 24V operation. I also then had a mishap with my 24V heater cartridge, ( I blew it up!) and 'We Do 3D Printing' got two replacements to me the next day so I could print all the nice objects for the show, just in time. Thanks guys. 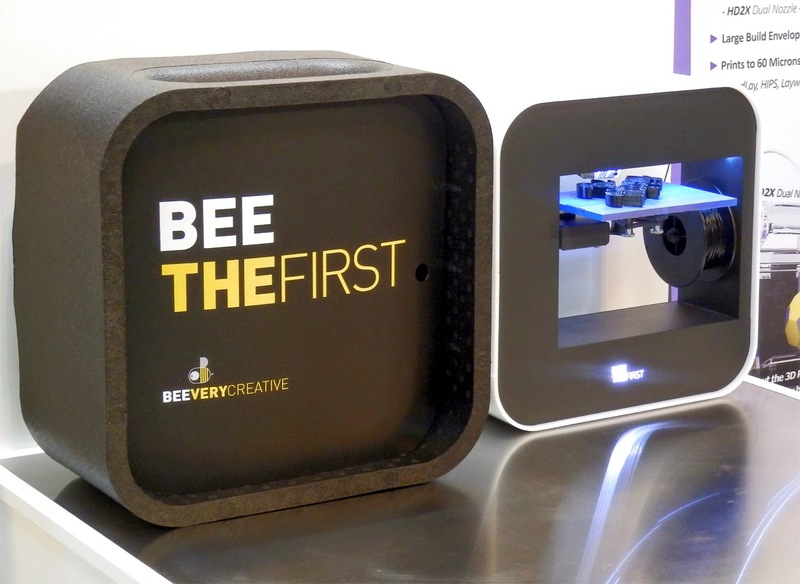 Bee Very Creative - had a buzzing stand and a lot of smiling visitors. FormLabs had the Form1+ on display. 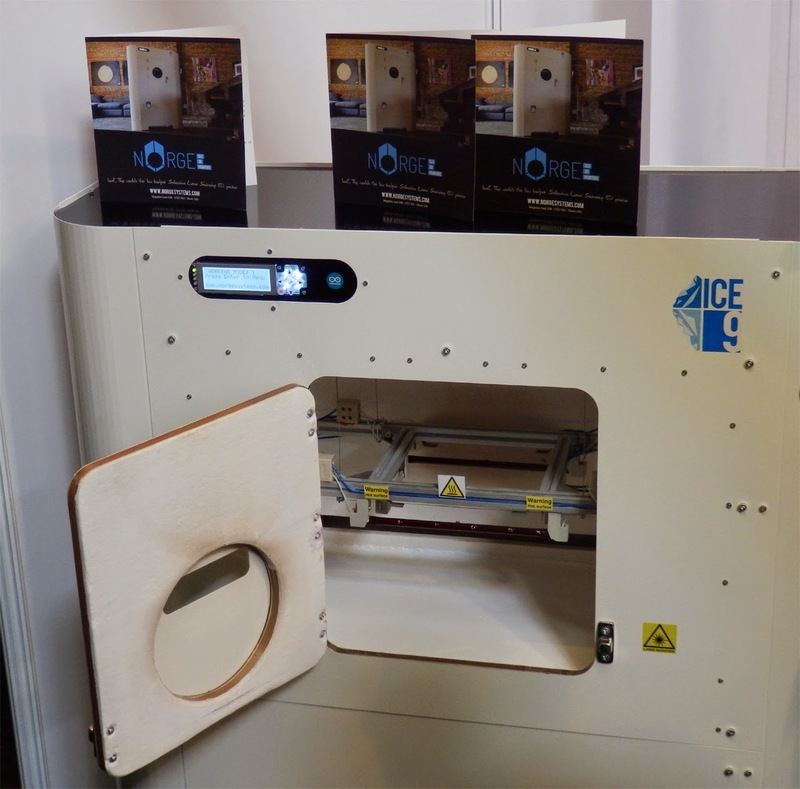 These machines were attracting a lot of attention with business customers. I would have liked to see more samples, they had one medical part at the back, they should have had a rack of 'real' product prototypes on show - missed opportunity for them. 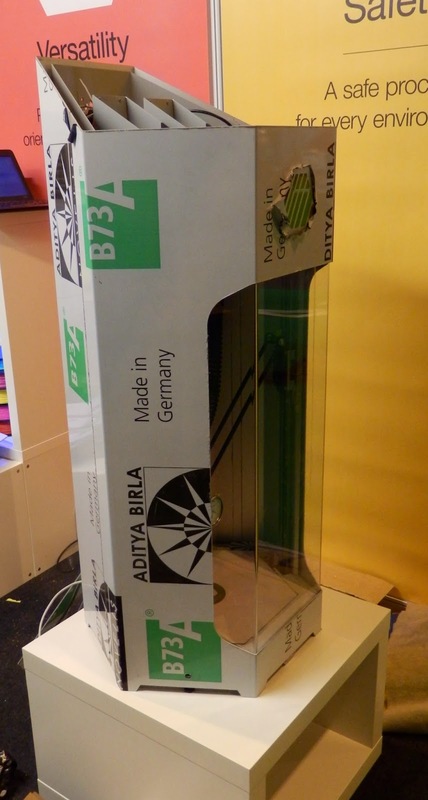 3DP Unlimited & PBC Linear - had a very large FDM based 3D printer. Printing very slowly, but some impressive results. They were all printed in PLA as you may imagine at this size. This photo gives you an idea of scale. These were impressive prints. My only disappointment was that they didn't seem to have any attribution for the printed models on show. That would have been nice, considering they were using the models as a significant sales tool. MadeSolid - Looking solid, great SLA resin. 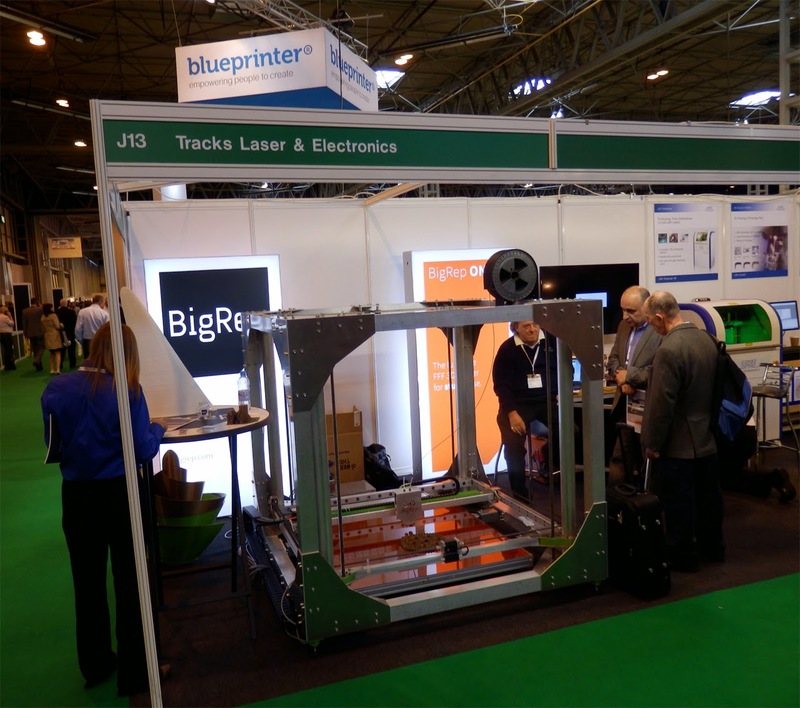 BigRep was being represented by Tracks Laser & Electronics - Another rather big FDM 3D Printer. 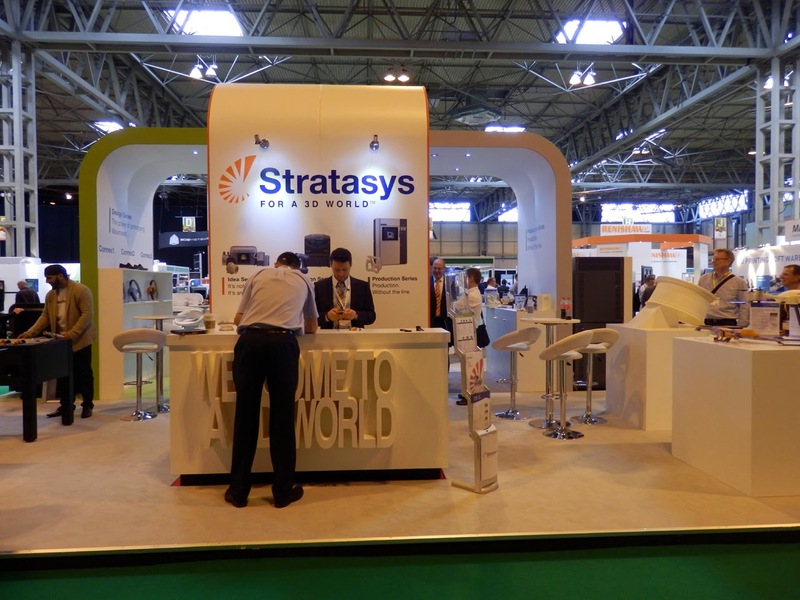 Stratasys - Nice stand and always interesting developments. 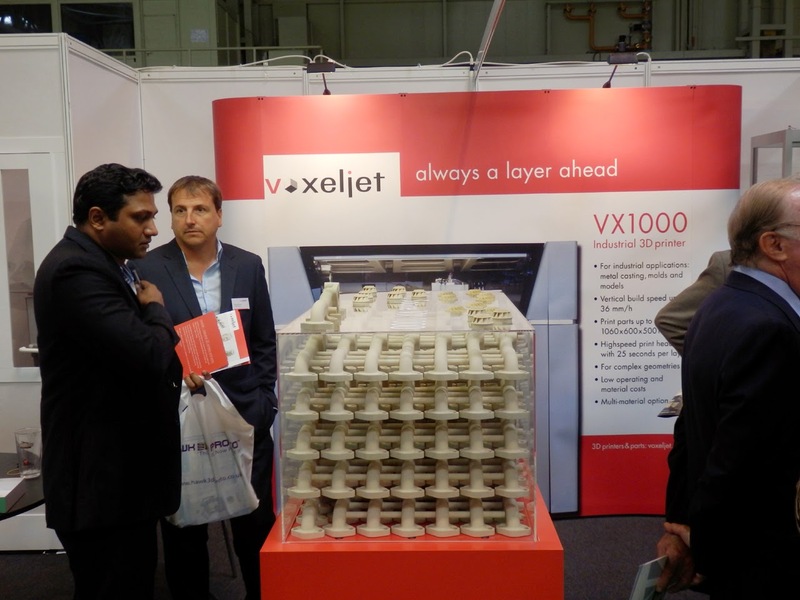 Voxeljet - Great technology and giant printers. 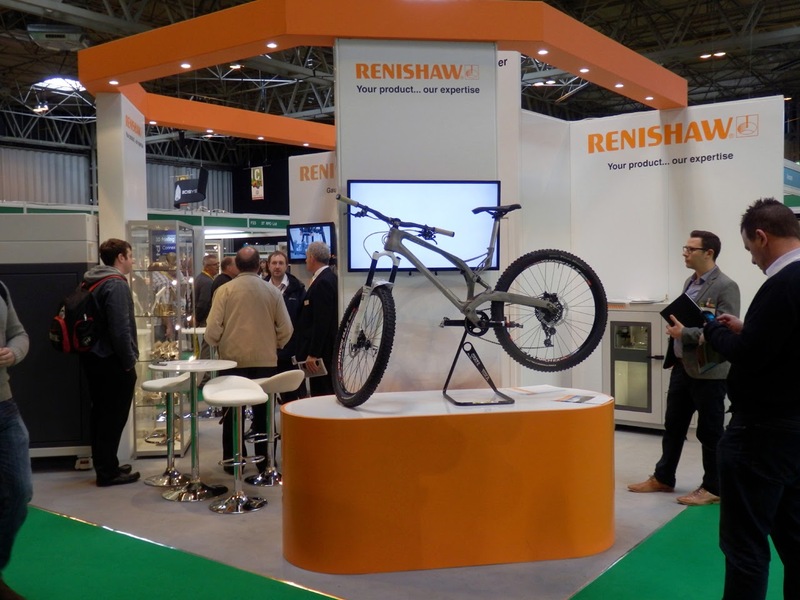 Renishaw - Local to me, a highly innovative company with plenty of technology in the 3D printing marketspace. I was waiting for the usual people to stop by the stand and state 'Not another F*c^ing vase' This time I came prepared with my 'effin vase' design. Well, it made me smile. If I had to award a prize to the company that twisted my brain the most, it would be Buzz Technology Ltd. 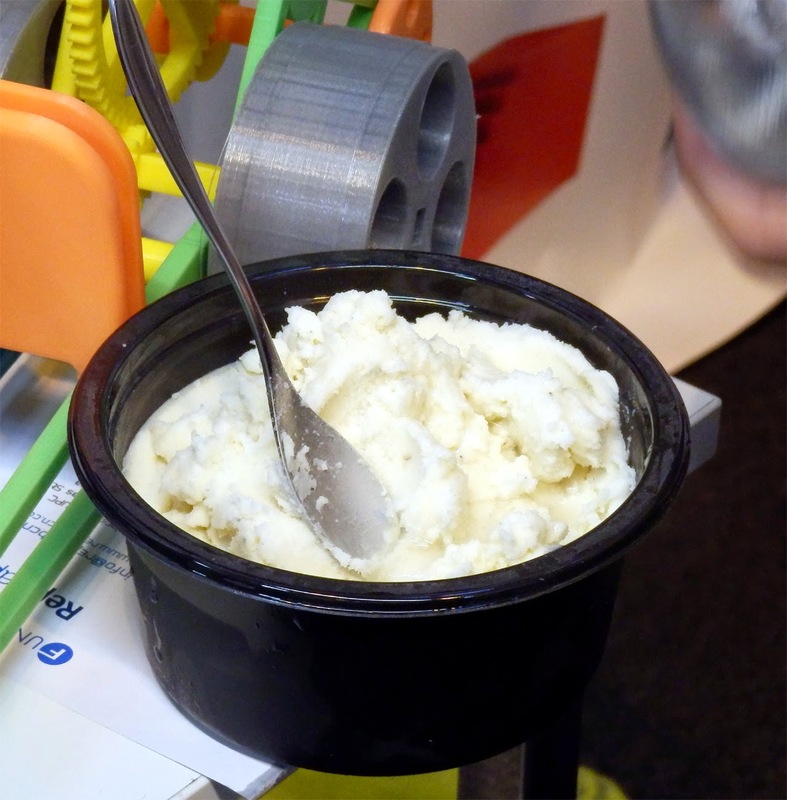 The 'prototypes' (concepts) on display were really to stimulate discussion, and that ventured into 3D printers being incorporated with dish-washing, tumble driers and 'salad preparation' - Head blown. 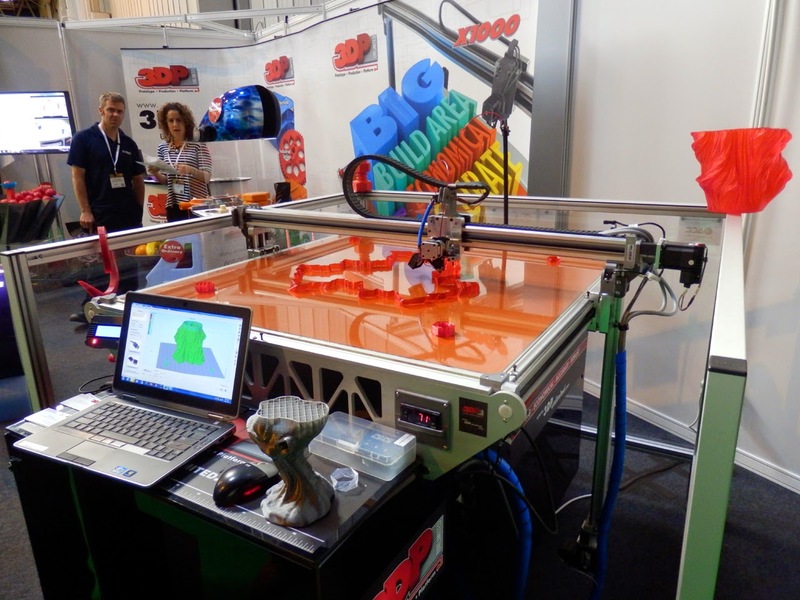 Along with house printing and robotic's, they have some challenges, not only with the technology implementation, but in people taking them seriously with such a diverse offering, but like everything that's not easy to understand it has some fascination to further explore where they will take this line of ideas. I wish them well and hope to see further progress next time. We had a highly impressive lineup of speakers for this years show. 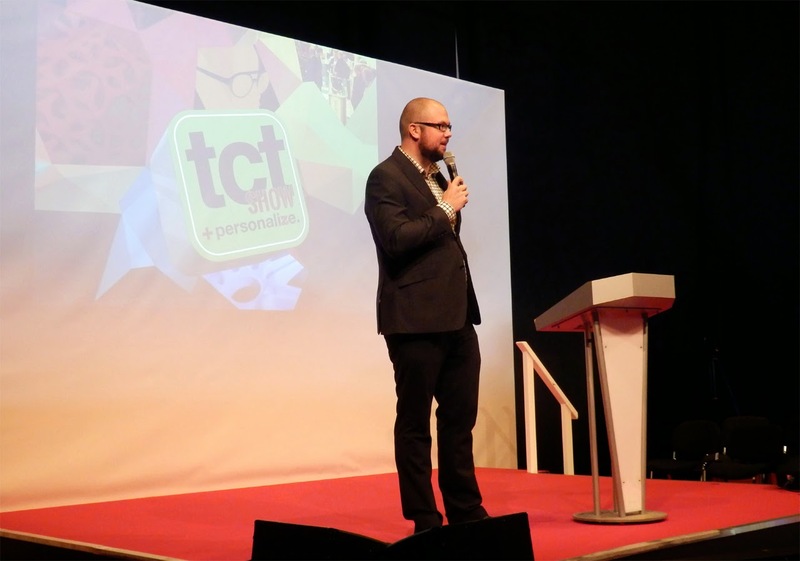 The TCT Show team excelled themselves with talent and interesting content. 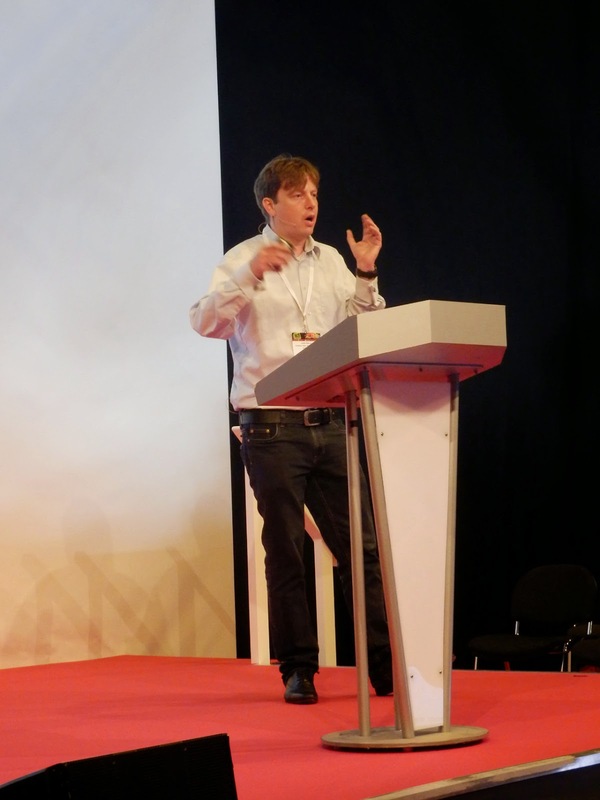 Far too many speakers to list and many have been covered on other sites, but I must point out a rather good presentation from Joris Peels. 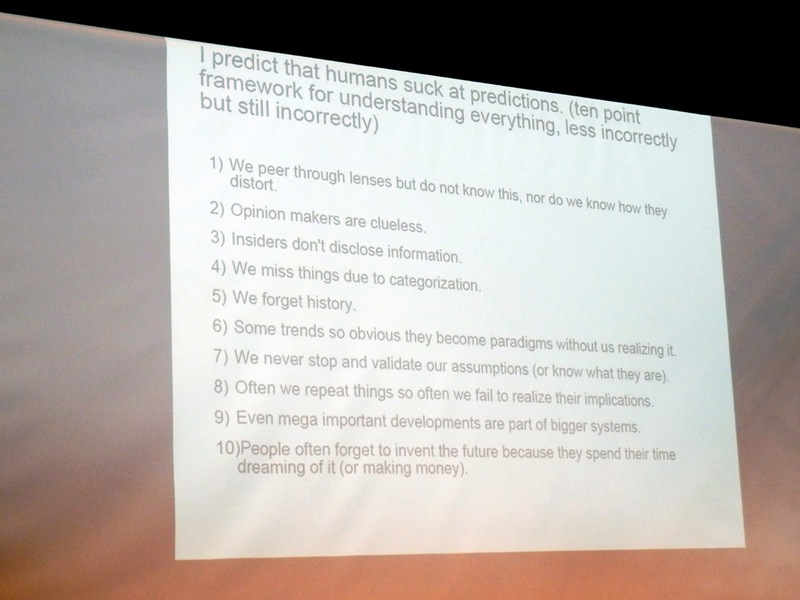 Joris Peels - with a thought provoking and great presentation. 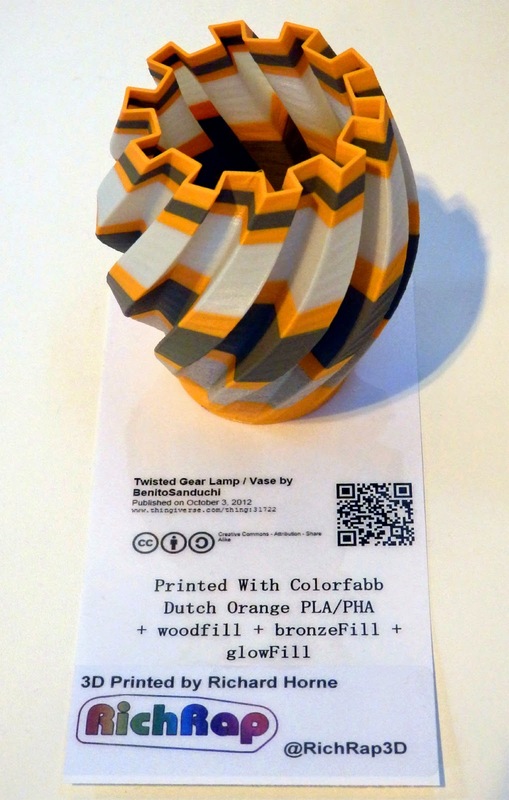 Joris is so passionate about the power of 3D printing, he makes you think. One evening Joris mentioned to me that when he tells people about 3D printing, he can't quite understand why they don't immediately stop what they are doing, hand in their notice and get straight involved with this industry. He has a point with yearly 30%+ growth and almost infinite potential. And another quick shout out to mekhanikos - I have been working with Joris on projects and ideas for mekhanikos - this is a platform to get really good open source products out to more people. If you have a great open-source project and need some help making people aware of it, let us know. I hope you can support it, or at least take a look here to read what it's all about. Anyone that talked to me late Thursday afternoon may not have had quite as enthusiastic discussion as we wanted, I was exhausted by that point, so apologies and catch up with me again next time. I really did meet up with a record number of people this time around. Thank you all for visiting. It would be really great to hear from more people that would like to get involved next year, We had some issues that Makerfaire Rome and the Open source hardware summit were also overlapping with the TCT show this year, that's something that will not happen again next year. 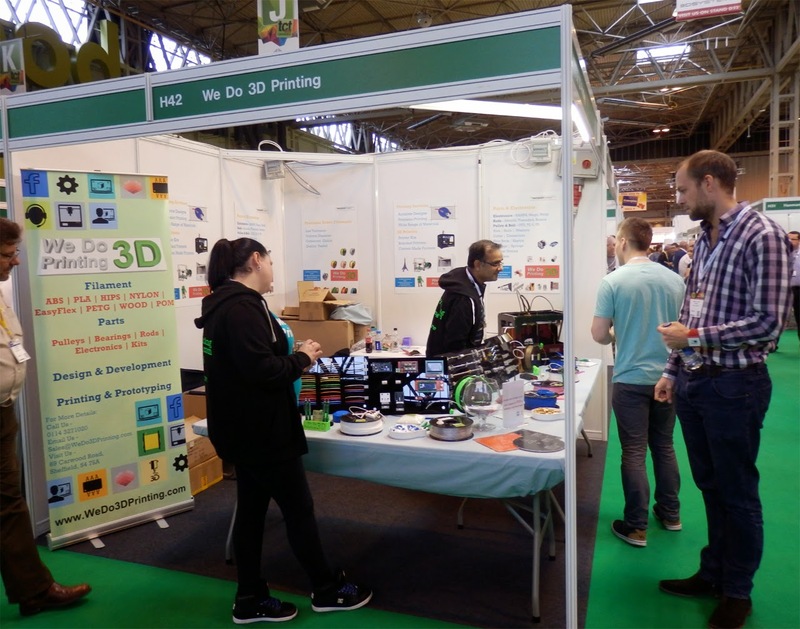 With your help we can grow the RepRap, Maker and Open-Source presence at the TCT Show, and it certainly makes for a very good event mixed in with the more traditional players in the 3D printing market-space. And if you are a talented or enthusiastic Photographer / Videographer and would like to help better document next year's show, do get in contact with me, for the history books we need more moments like this captured in time. RepRap : The Movie ! And more on the lines of capturing history, Brook Drumm (CEO of Printrbot) is investigating and planning the feasibility of making "RepRap : the Movie" - if you can get involved or want to be part of it, take a look at some of Brook's thoughts and follow the progress towards some crowd-funding goals. 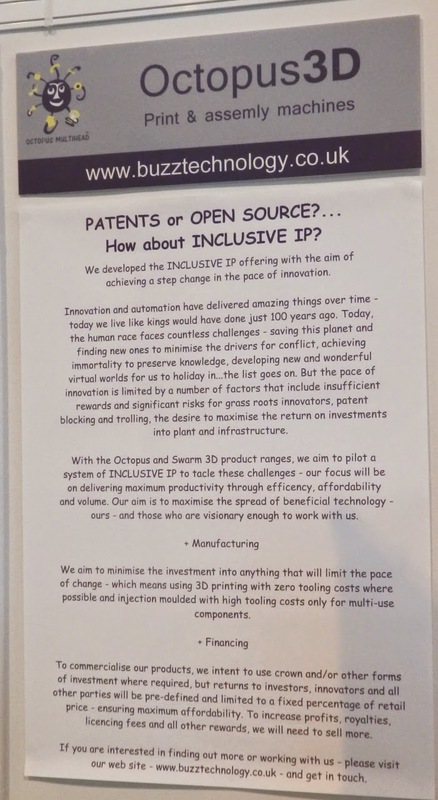 Hopefully we may end up with a documentary to capture this second revolution 3D Printing, instigated by RepRap and the wider Maker movement. - Just as I was typing this up Brook asked if I would like to be part of the RepRap Movie Advisory board, I obviously said Yes! immediately :) Thanks Brook. I really want to see this happen, and represent all the fantastic RepRap makers and projects going on all around the world. It would also be very nice as a piece of 3D Printing history. Often with history and hindsight companies and people are mis-represented (look at the early computer industry in Silicon Valley) so my own personal angle is to make sure history is documented correctly and a worldwide balance is provided. And on that note, because my mind started drifting into what would be interesting content (data and people) for the movie, some of you may find a few of my blogger static's interesting. 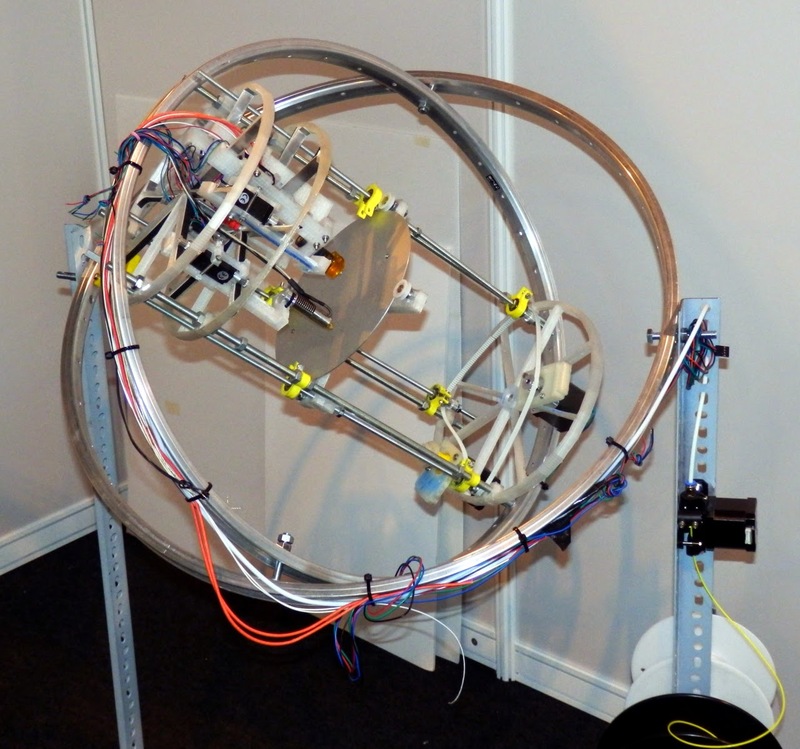 I have watched interest in RepRap 3D printing blossom around the world via Blogger since 2006. Before I even started documenting my RepRap 3D printing adventures, people were searching and finding RepRap related information. 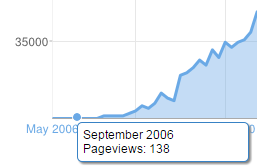 By mid 2010 we were at 35,000 visits a month and after that it just goes nuts. Now depending on what I blog about it can be anywhere from 200K to 1M ! Add G+, YouTube and Twitter and it's easy to see a lot of people are now highly involved with all aspects of 3D printing. The world map has also been great to see fill in. With Blogger is shows the concentrations of visits via country. One of the most interesting regions has been South America. and even though it now looks like the rest of the world there have been patches of intense interest from South America, especially Chile, I have had some fantastic conversations with people in SA and I hope it continues to grow. 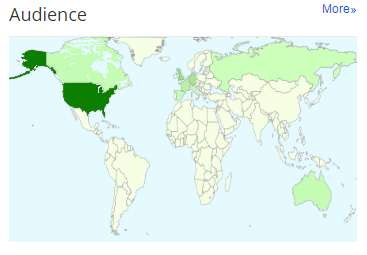 From almost Day 1 Australia & New Zealand and Canada had a sustained number of visitors to my blog. 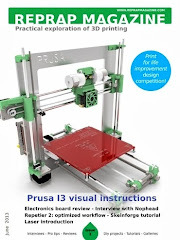 - It's interesting that RepRap did distribute to these global regions with people from the original project - Vic Oliver in NZ and Sebastian Ballard in Canada. - And Sebastian, if you are still involved in RepRap I would really like to hear from you again. Anyway, maybe much more on that for the movie :) I hope you liked the TCT Show update. So, Apologies to anyone I didn't have a photo for, or if I missed you out of this review, add a comment below and I'll update. Ivor has a fantastic review, lots of photo's & info over Here - thank you so much for everything Ivor. I had planned a video to go with this post, but doing that has already delayed me posting, so I'll update when it's completed. I still have a massive amount of work to share - and document :( - lacking time but bear with me, winter is coming and many more really cool projects in the works.